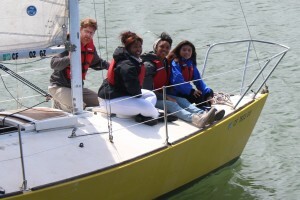 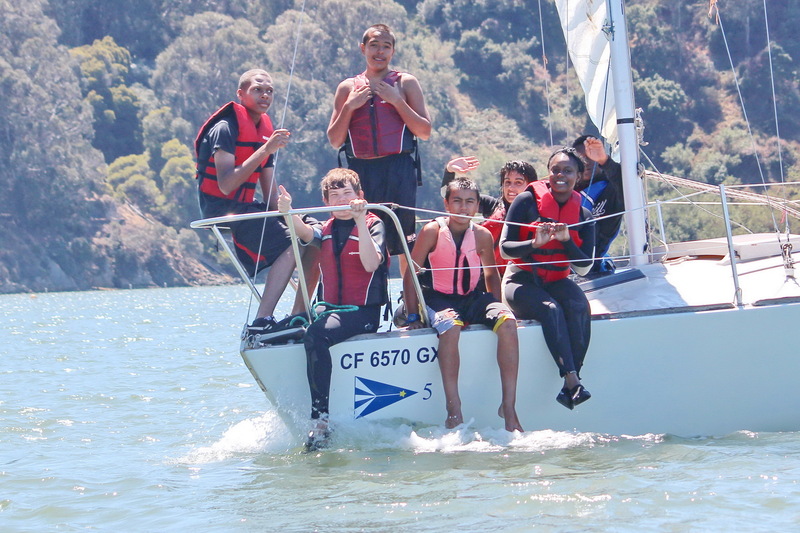 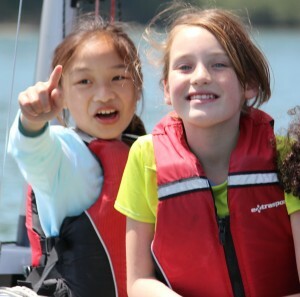 Connect a TISC instructor, one motivated volunteer and 11 Huckleberry Wellness Academy students with J/24′s on Clipper Cove and you get 37 Sailing Superlatives! 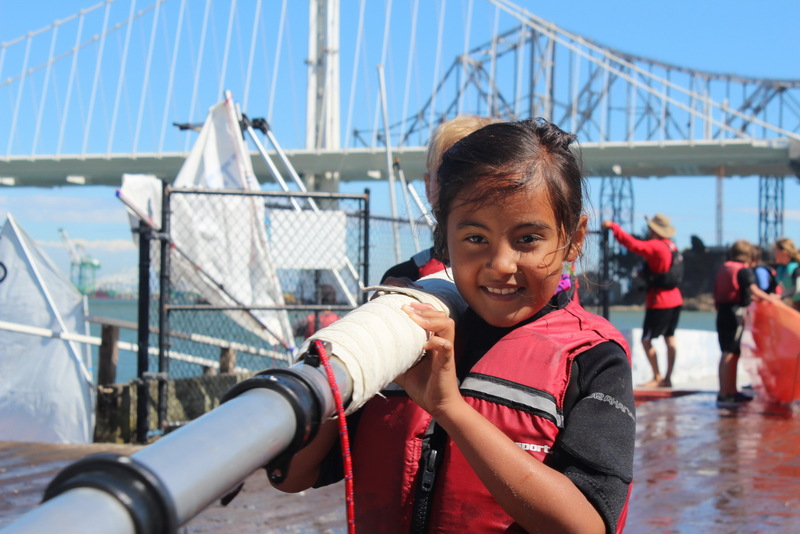 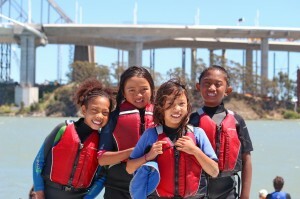 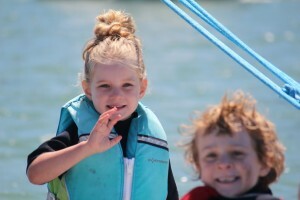 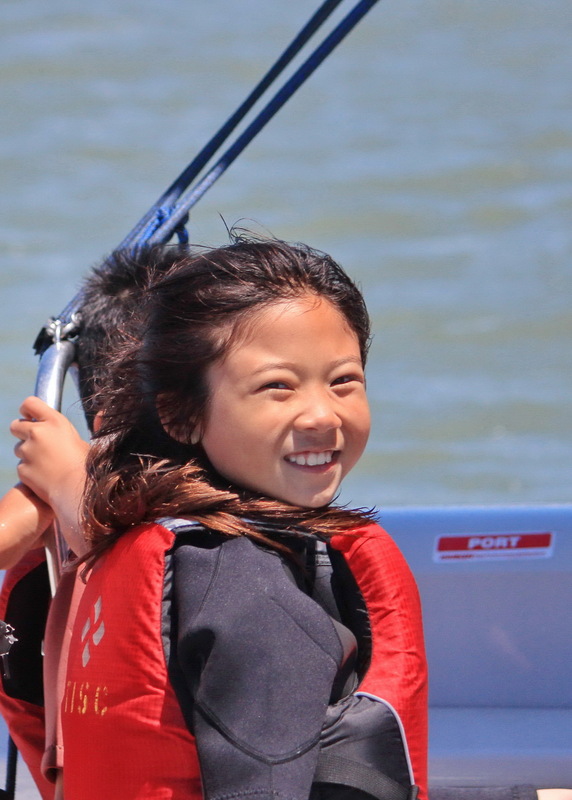 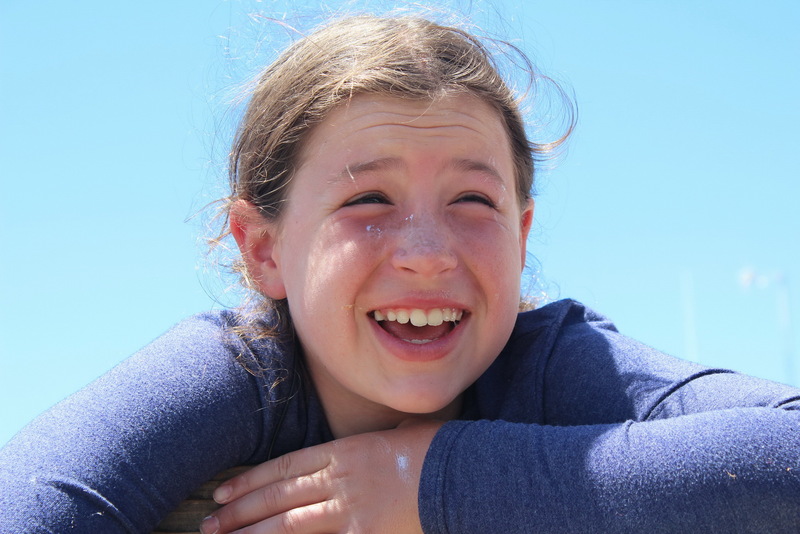 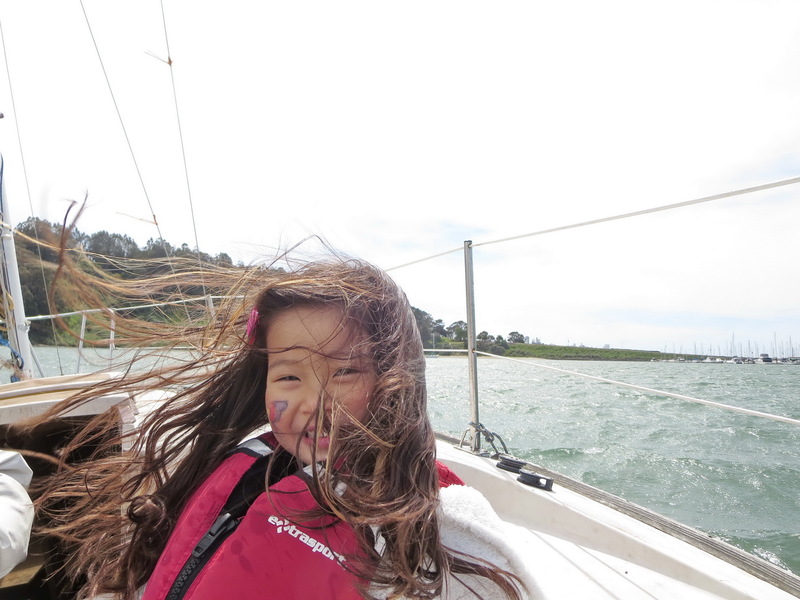 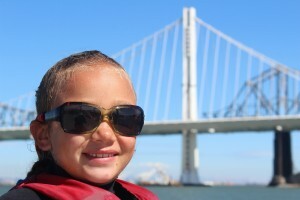 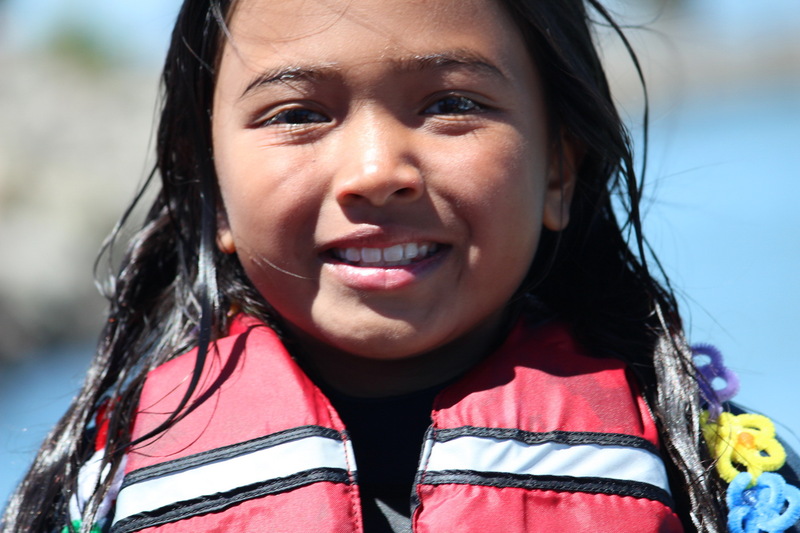 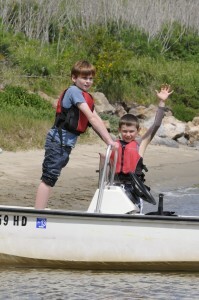 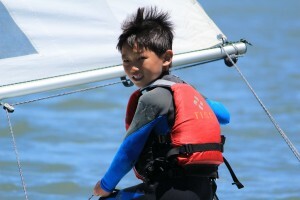 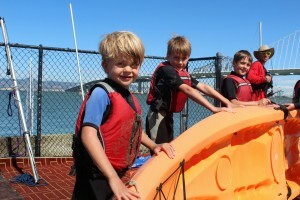 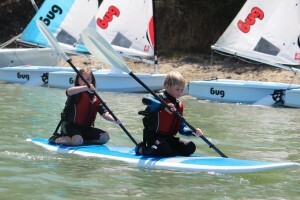 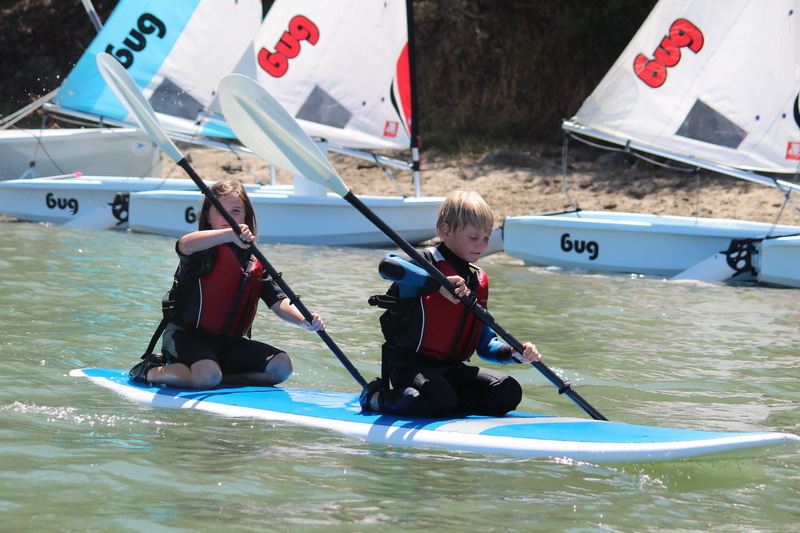 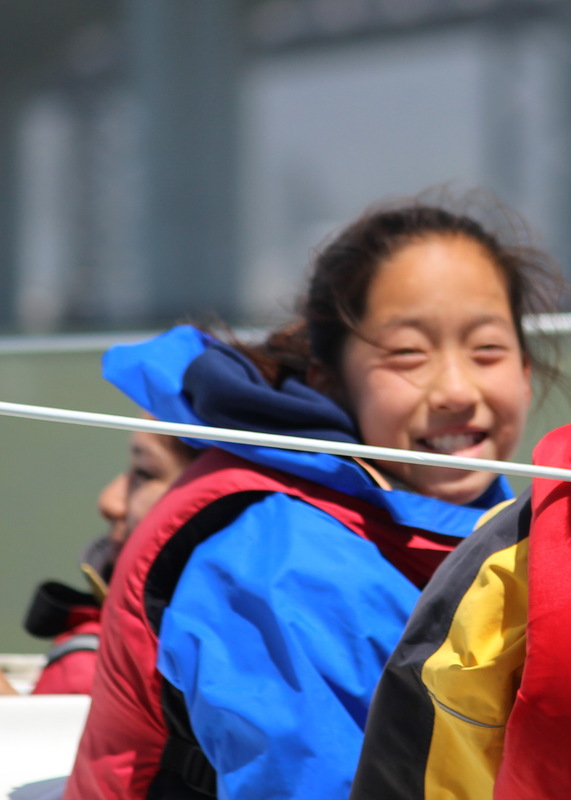 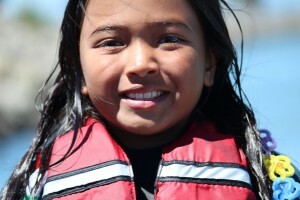 Here’s what the kids had to say, and how you can share your passion for sailing. 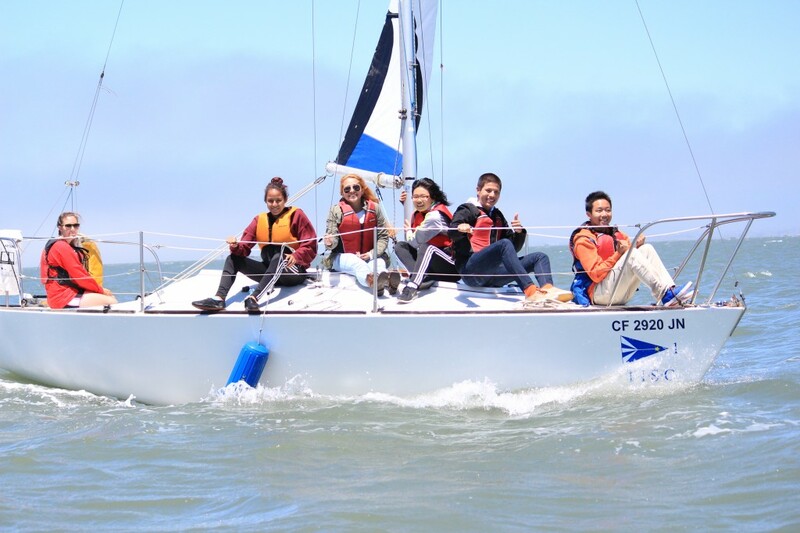 The Huckleberry Wellness Academy – San Francisco is an intensive three-year health career pipeline program that fosters interest and engagement in health-related professions. It’s primarily funded by a grant from San Francisco’s Department of Children, Youth, and their Families, one of our partners. 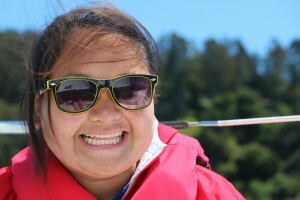 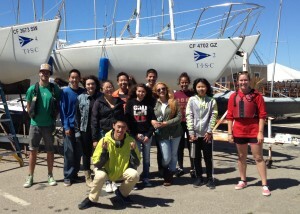 We asked the Huckleberry students for a “one liner” to describe their June 26th afternoon sail with us. Below is what they had to say, interspersed with pictures from the day. 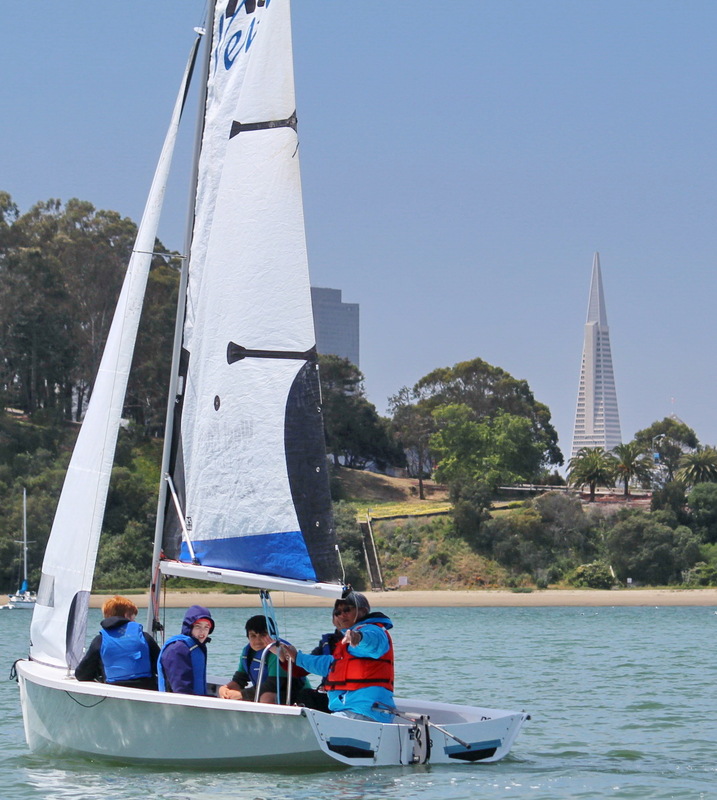 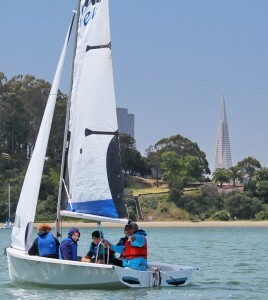 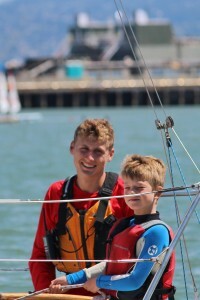 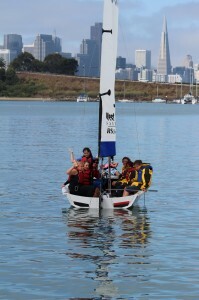 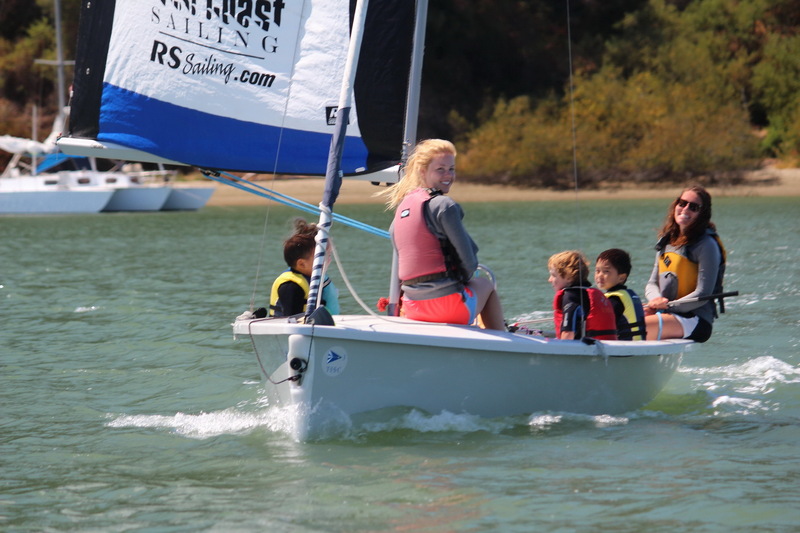 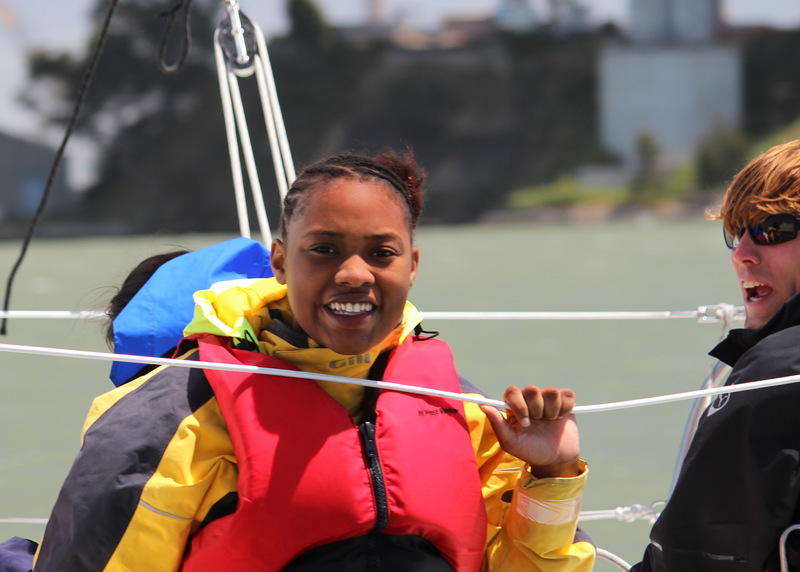 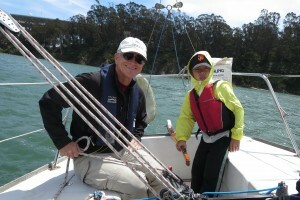 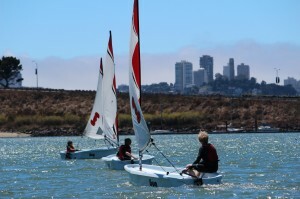 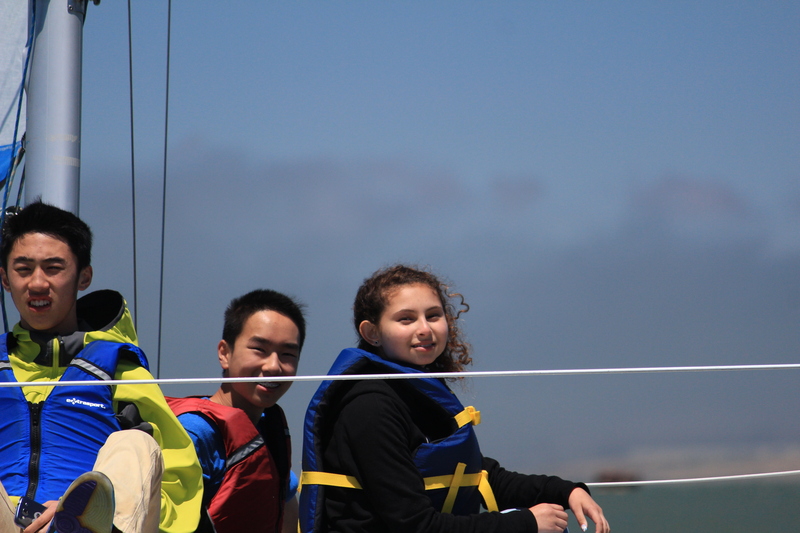 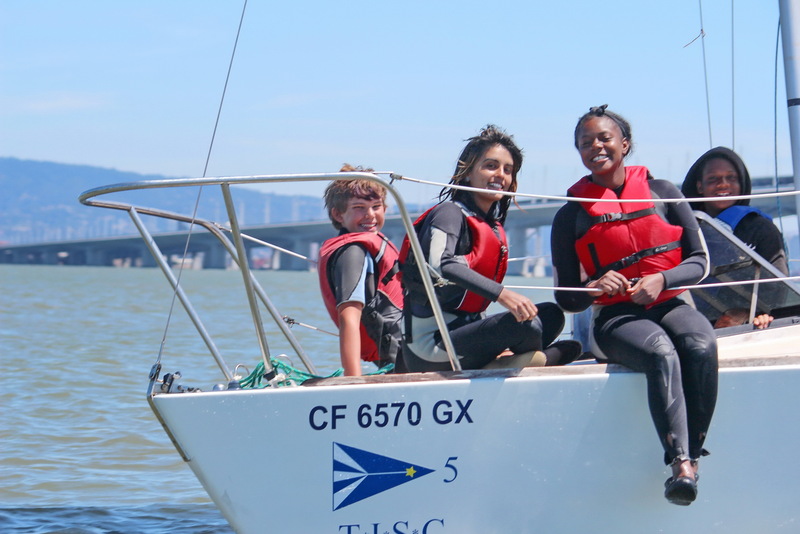 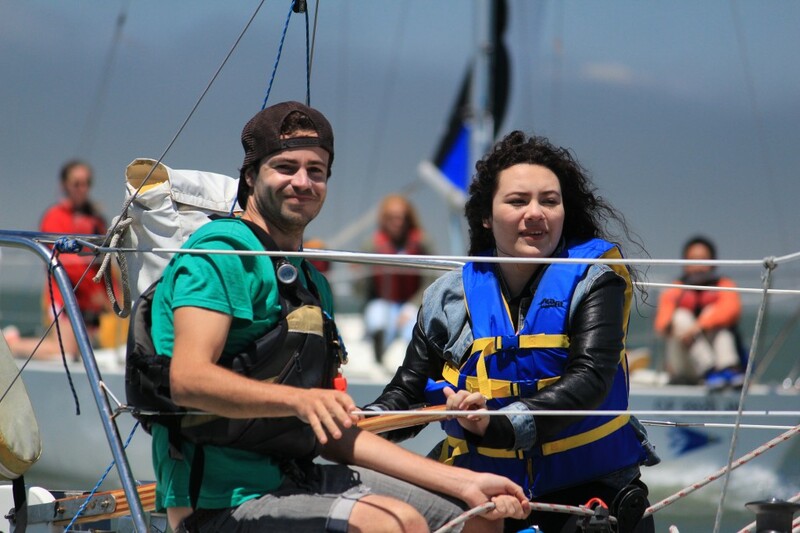 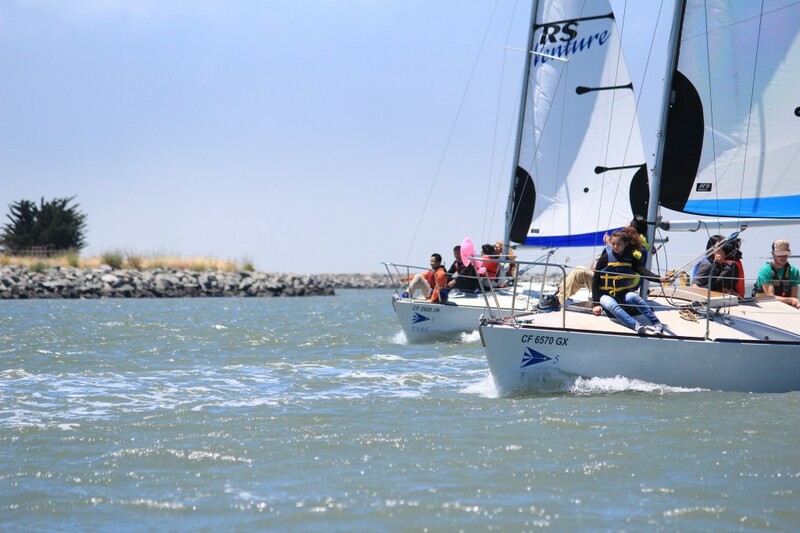 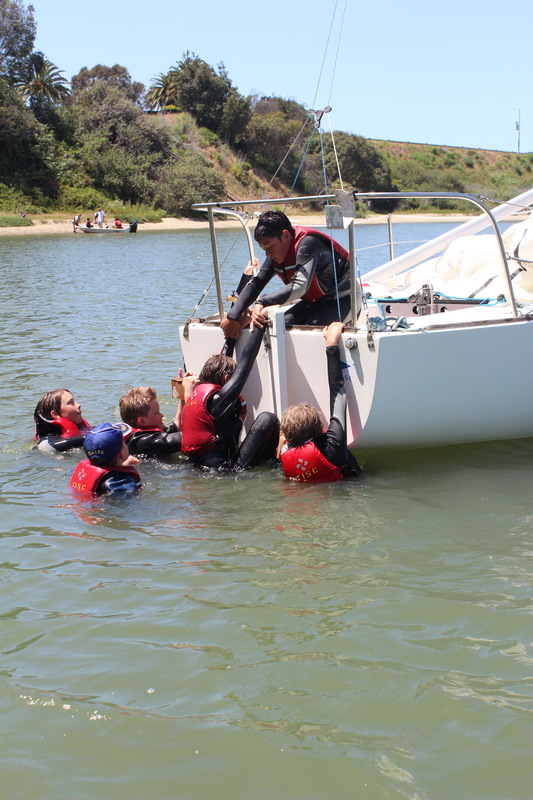 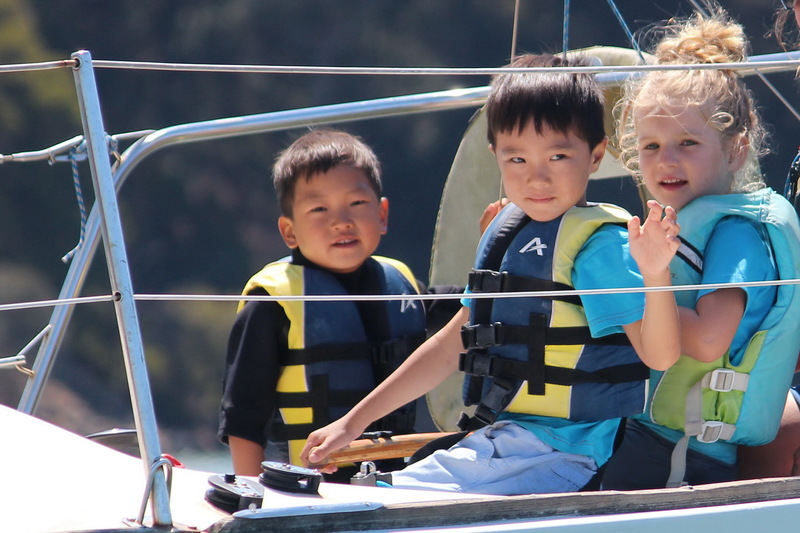 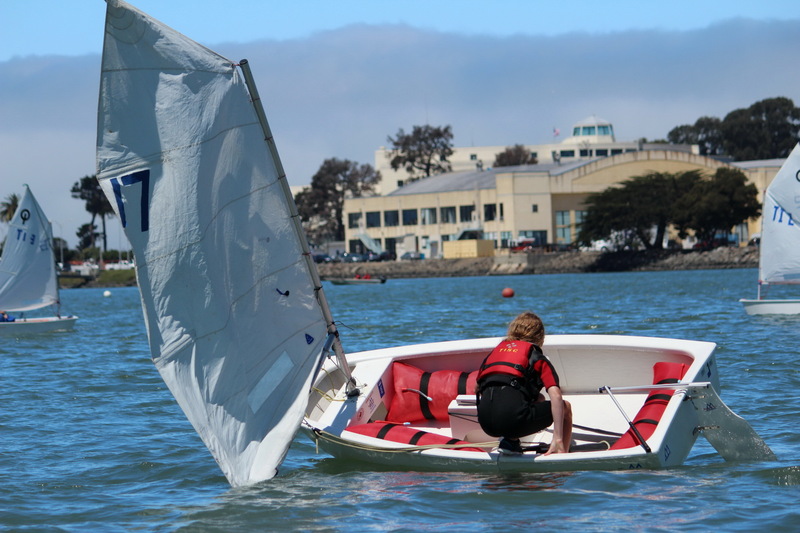 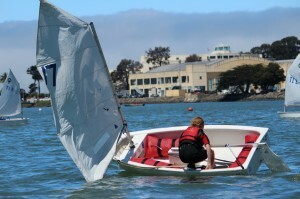 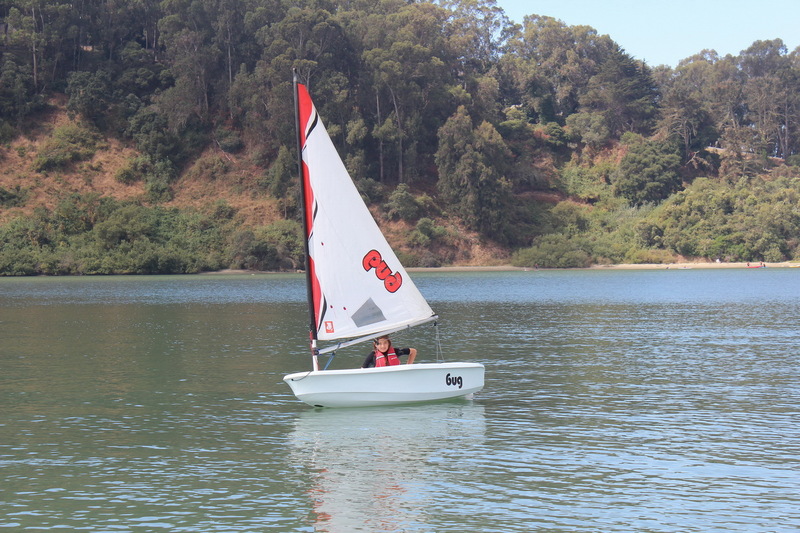 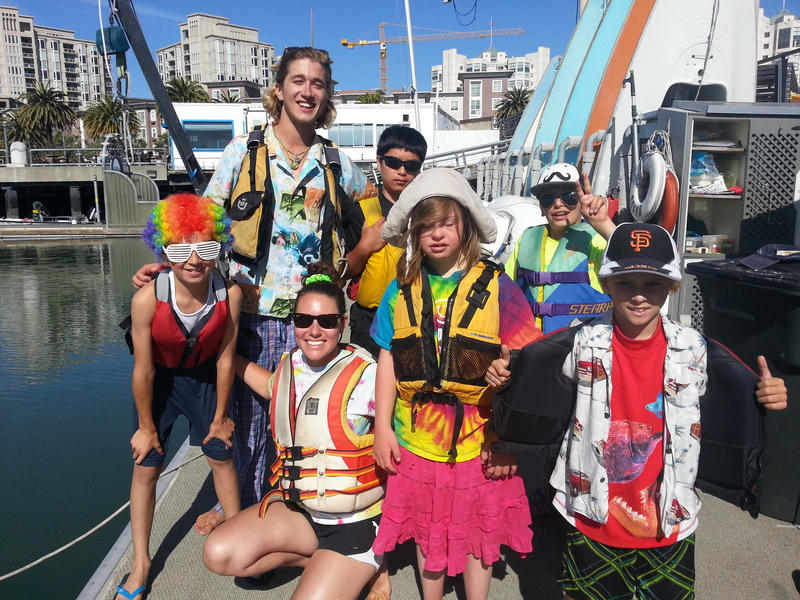 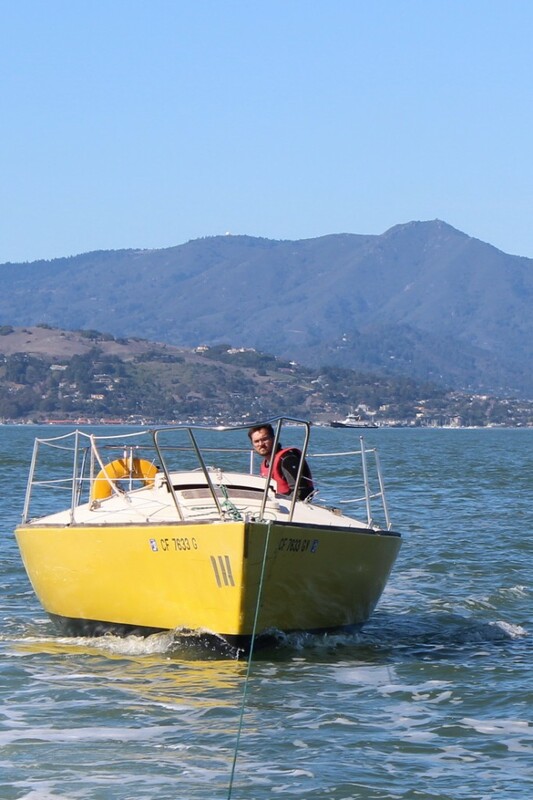 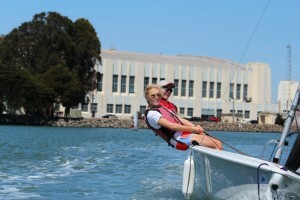 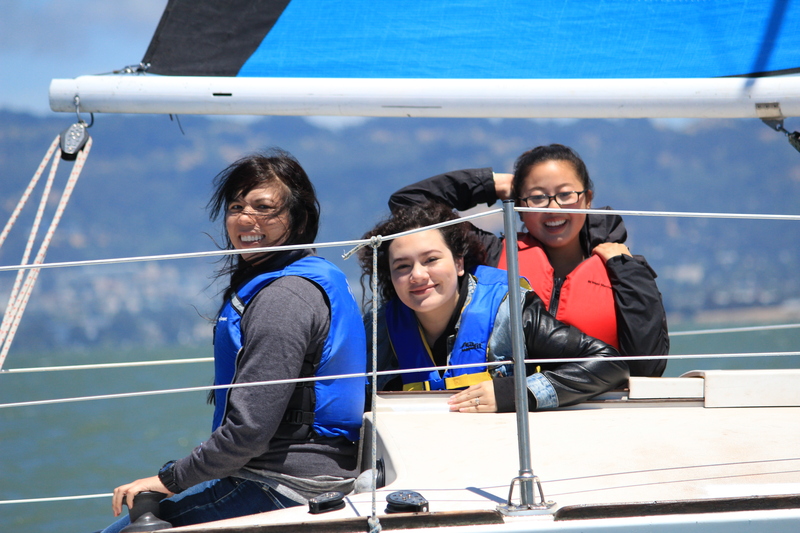 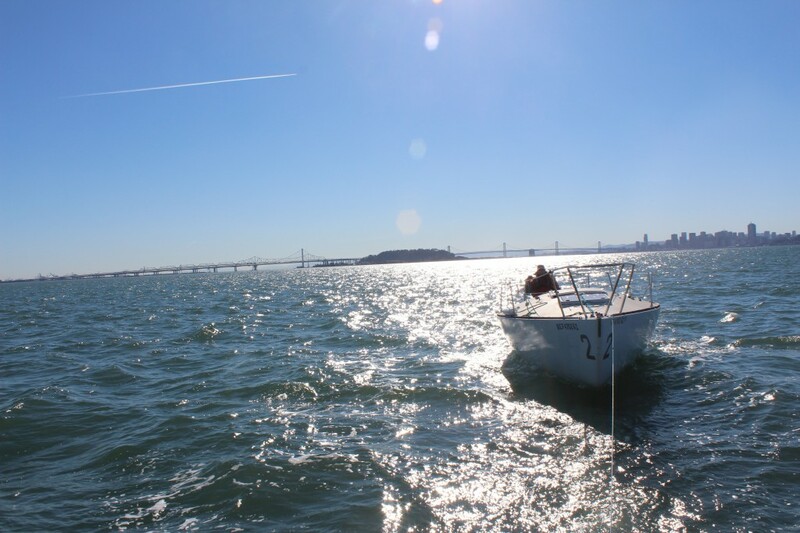 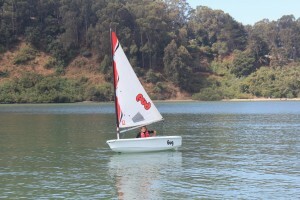 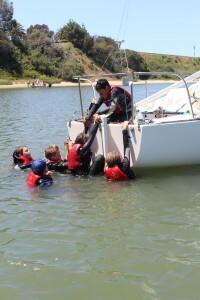 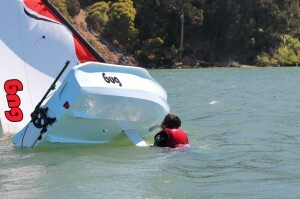 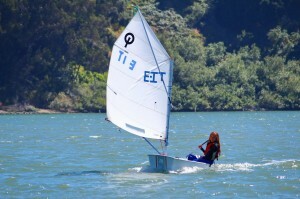 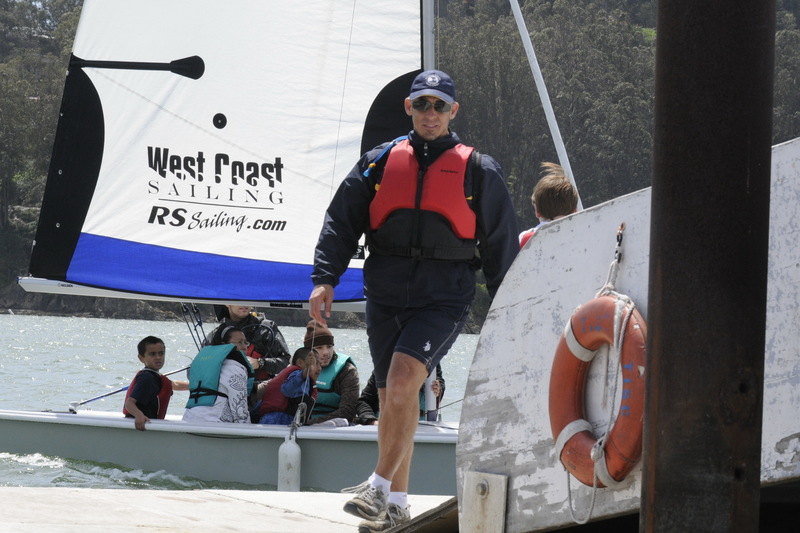 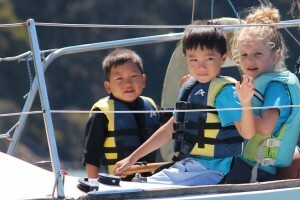 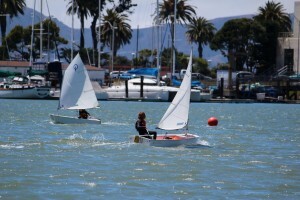 Teaching life lessons through sailing is a great mission loved by everyone here at Treasure Island Sailing Center. Our programs provide opportunities for 4th graders, make a difference for youth who sail here, and benefit tenants who call TISC home port. 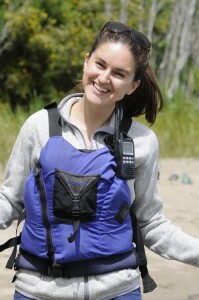 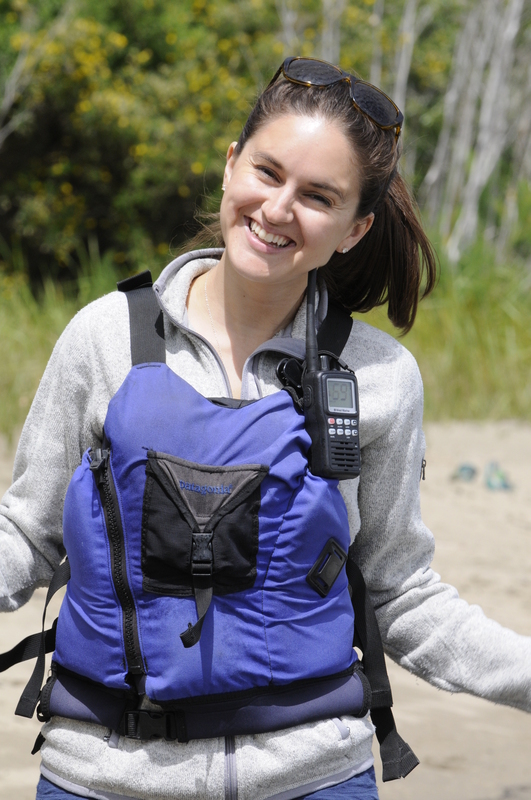 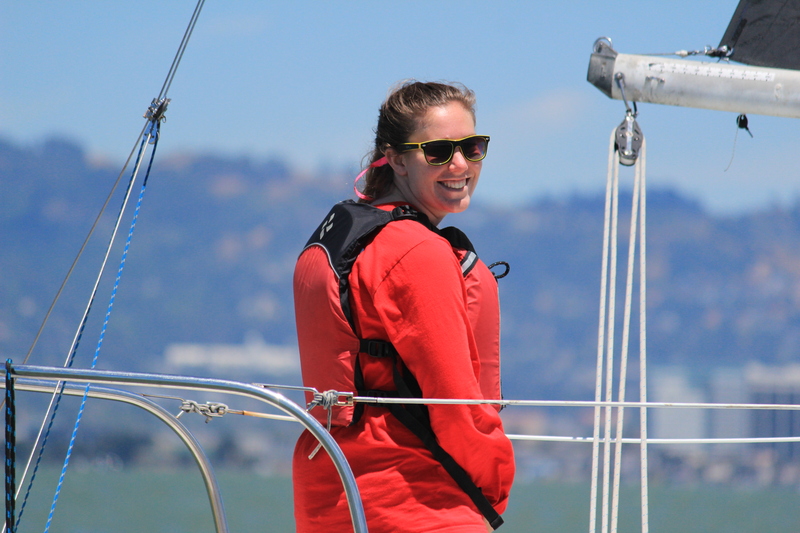 Our 2014 instructors, including Sonya above, are experienced sailors and savvy teachers. 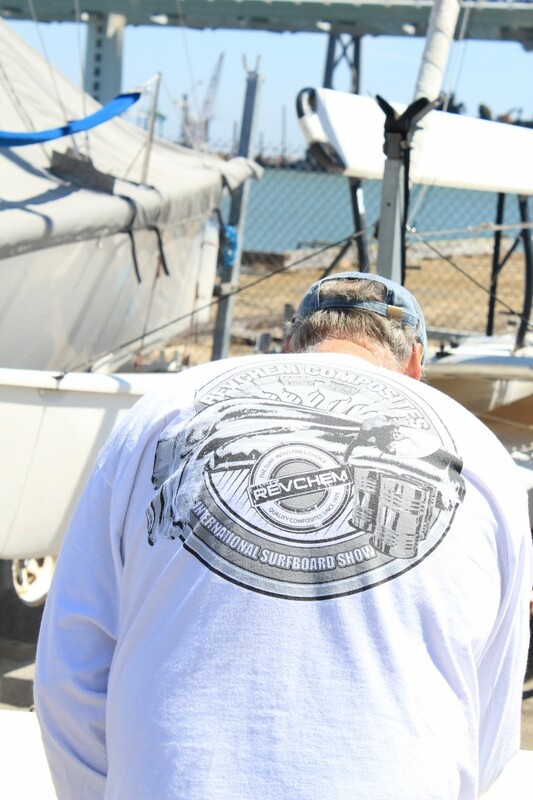 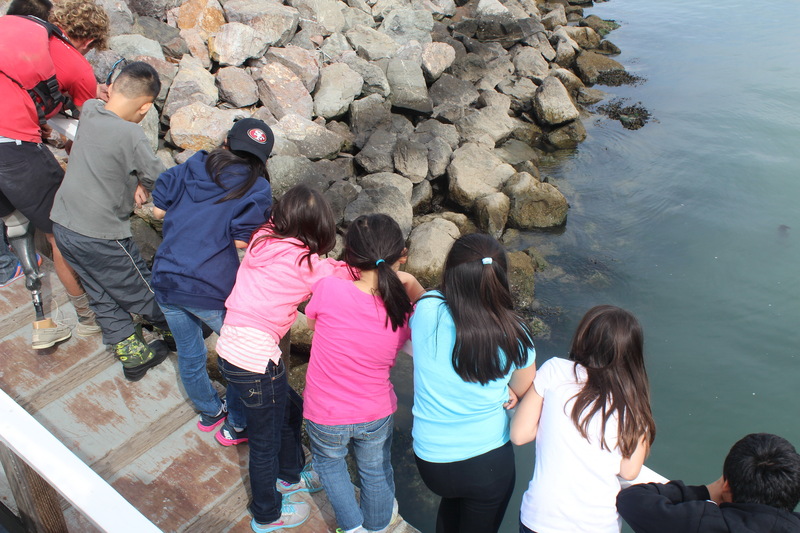 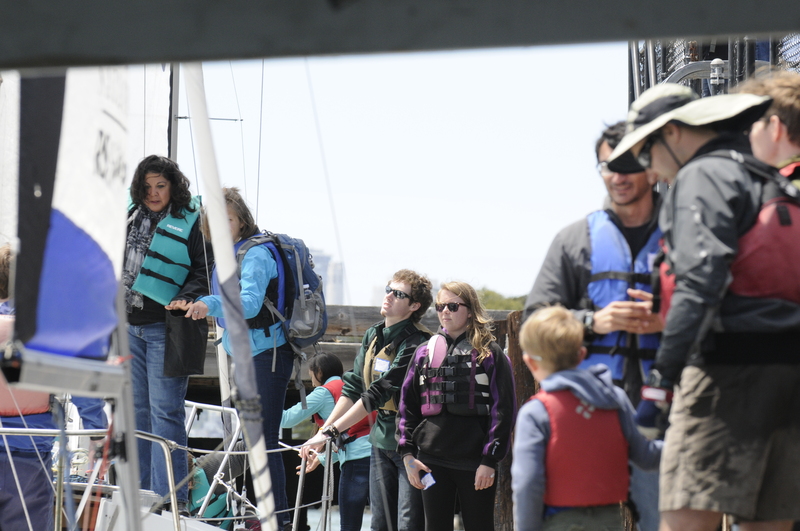 We couldn’t do what we do without the volunteers who help maintain our docks and facilities, support our many events and share their love of the water and the lessons they’ve learned with the kids, youth and adults who sail here. 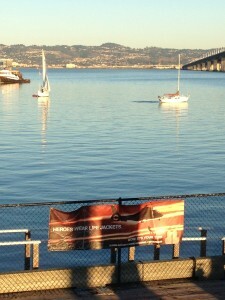 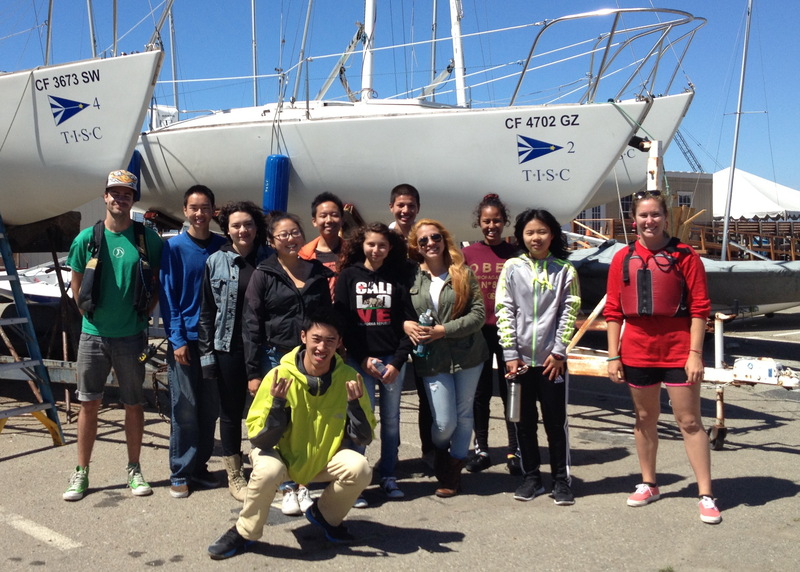 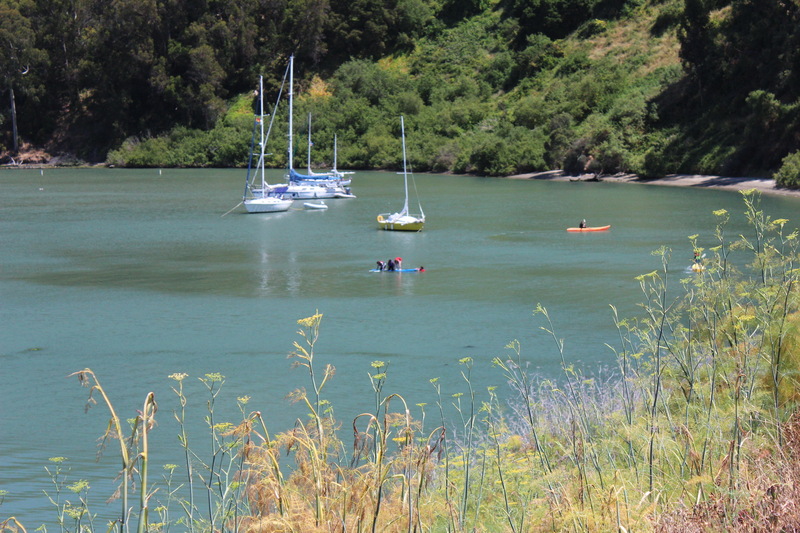 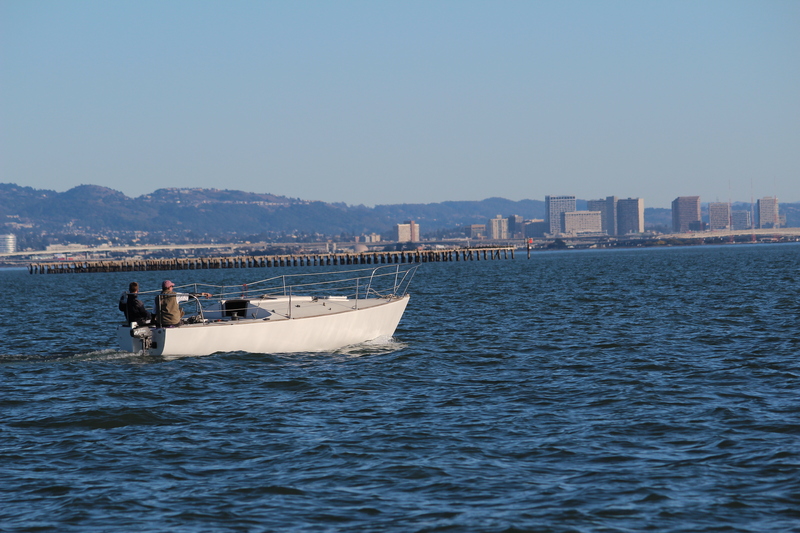 Tioga, green shirt below, donated his afternoon with the Huckleberry youth on Clipper Cove and out on the bay. 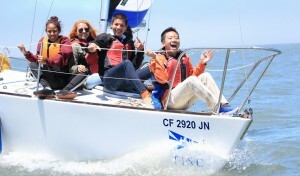 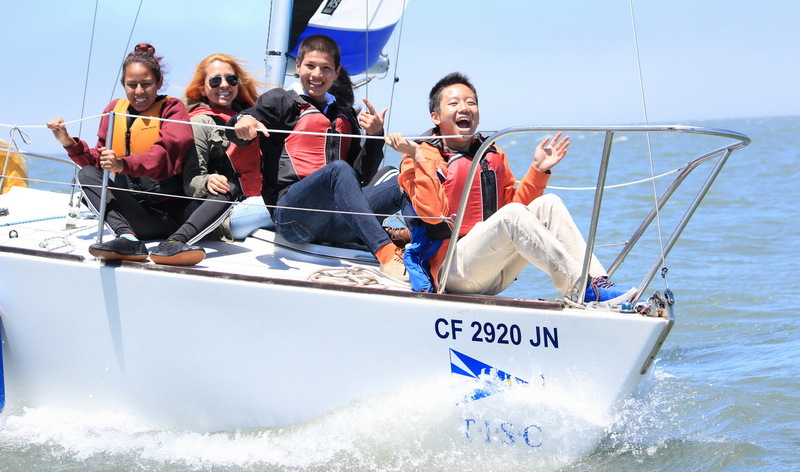 These first-generation college bound students now understand a bit about the wind, sails, tides and how to steer courtesy of his passion and experiece. 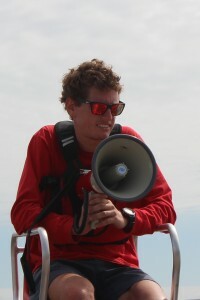 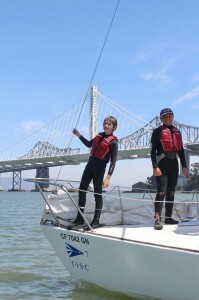 I encourage every tenant who can sail during the week, or on weekends when we host visually impaired sailors, to call Chris Childers in the TISC office and schedule time for on-the-water passion sharing. 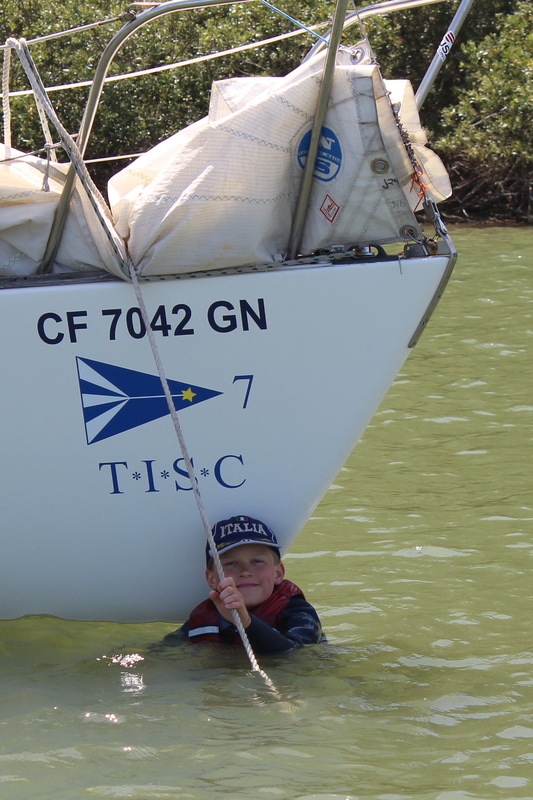 I can’t think of a better way for you to meet the volunteer hours called for as part of your boat storage agreement with TISC. 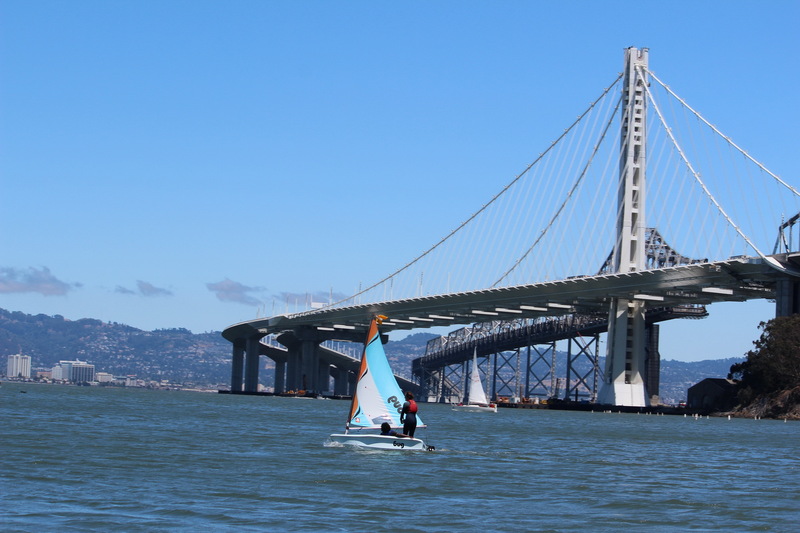 And face it, no one has ever had a bad day on the bay while providing a launching point for new horizons for kids and youth ! 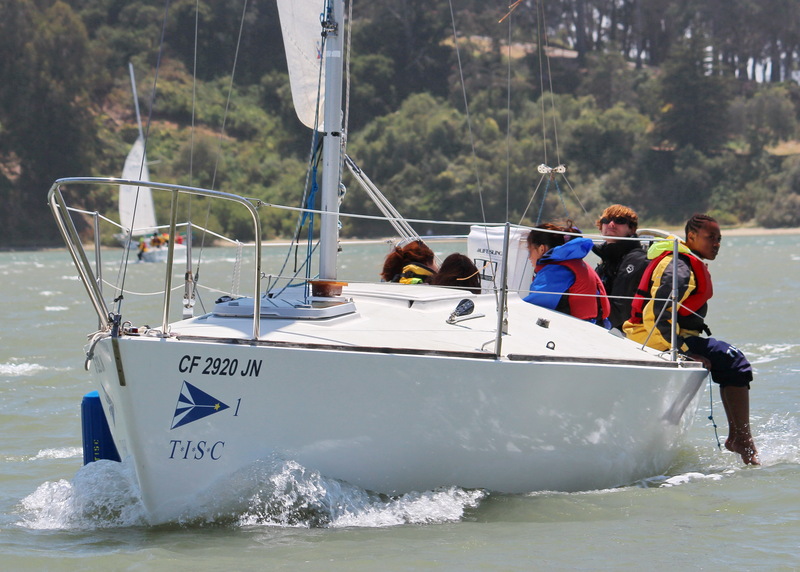 The TISC J/24 fleet is sporting newly-painted hulls and crisp graphics thanks to Bay Marine Boatworks and Signarama San Jose. 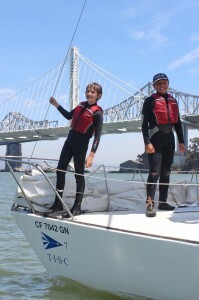 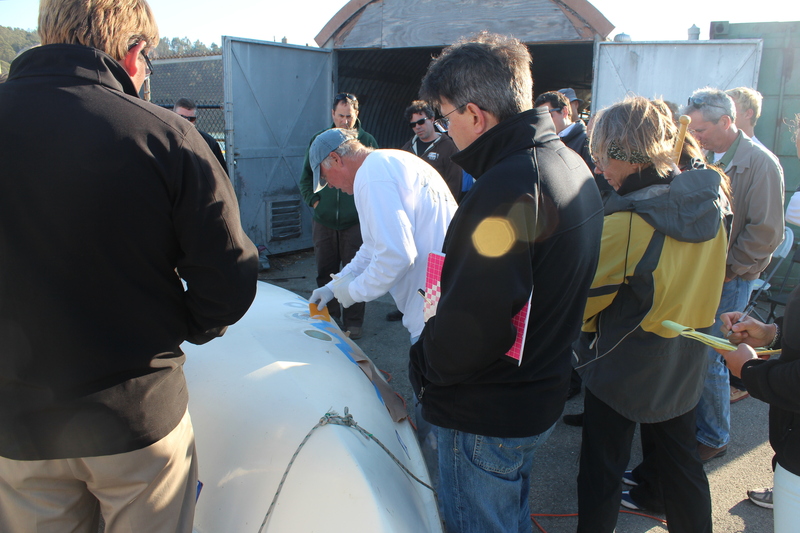 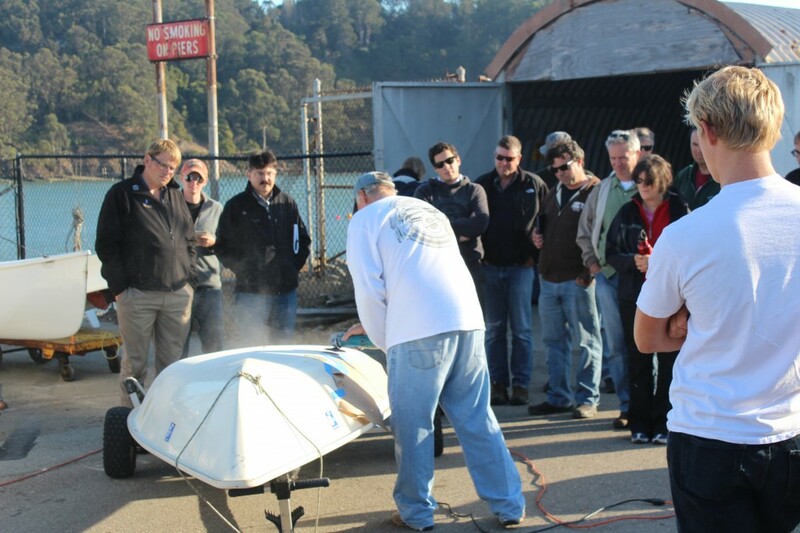 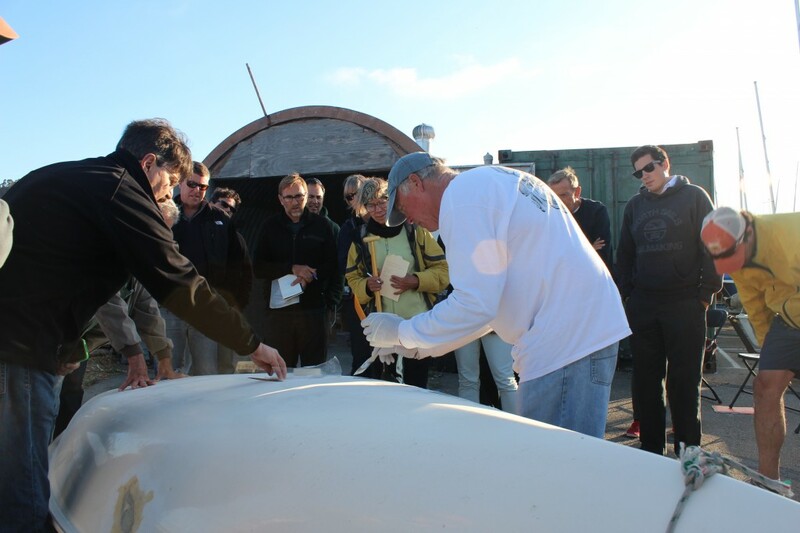 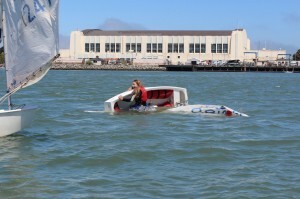 This project was funded by the 34th America’s Cup and ONESF. Summer smiles now available for all San Francisco youth. 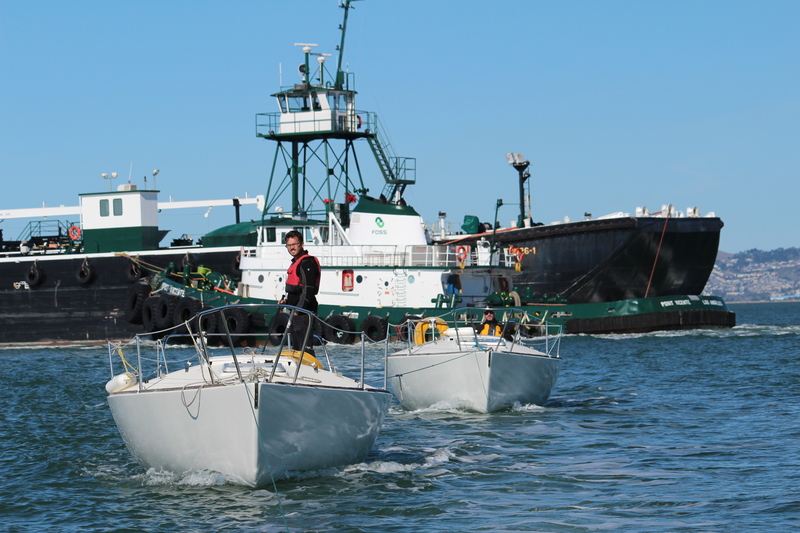 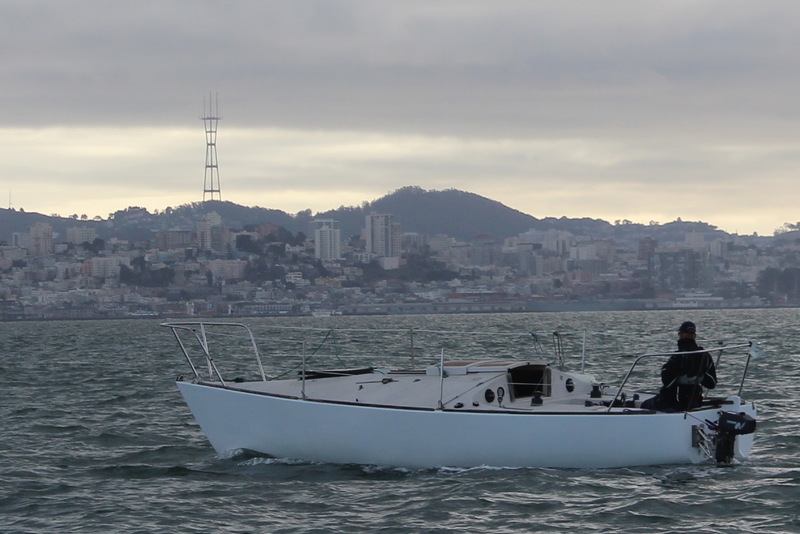 Delos and Barney headed for Bay Marine Boatworks last October. 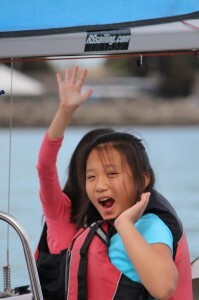 Five more Js followed. 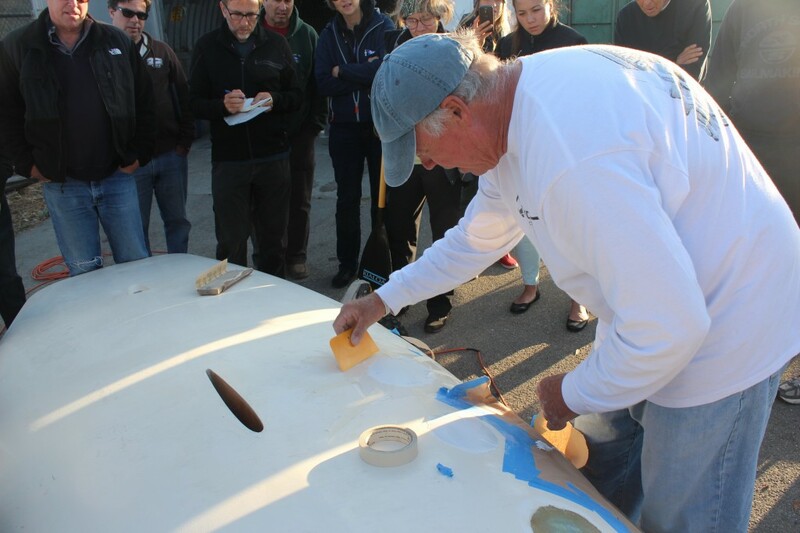 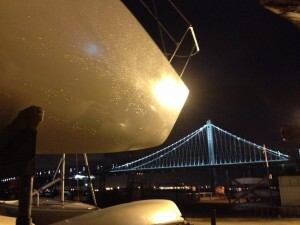 The project managers, painters and yard team delivered a class job on every boat. 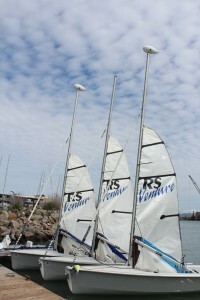 Even though a couple appeared as if “they had been used as rounding marks during a hard-fought regatta”, all were returned with smooth, attractive white hulls. 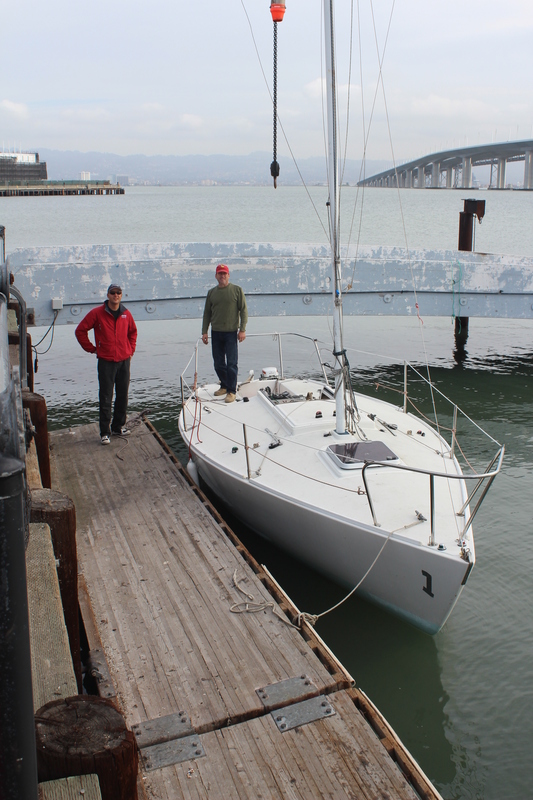 The team at Signarama San Jose provided design support for the bow and stern graphics as well as the registration numbers for the J/24 fleet. 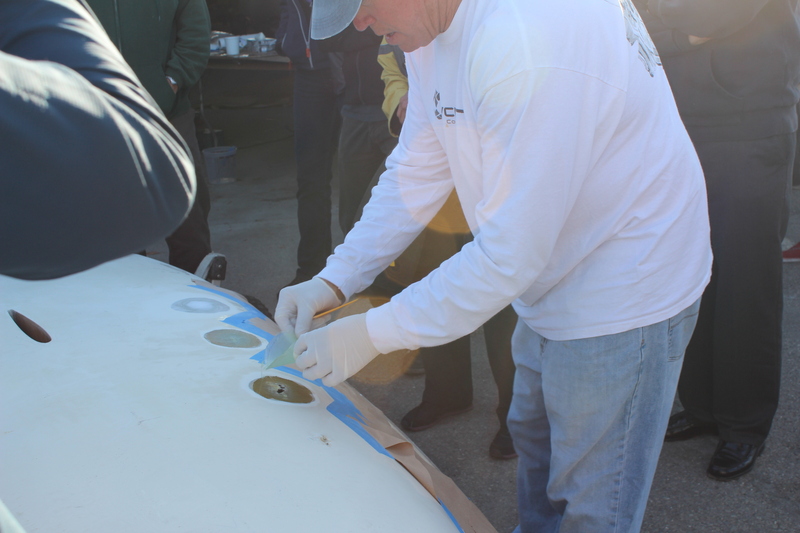 They guided us through the installation of the 35 unique graphics fabricated for our project, and helped us adapt the design and layout to our RS Venture and FJ fleets. 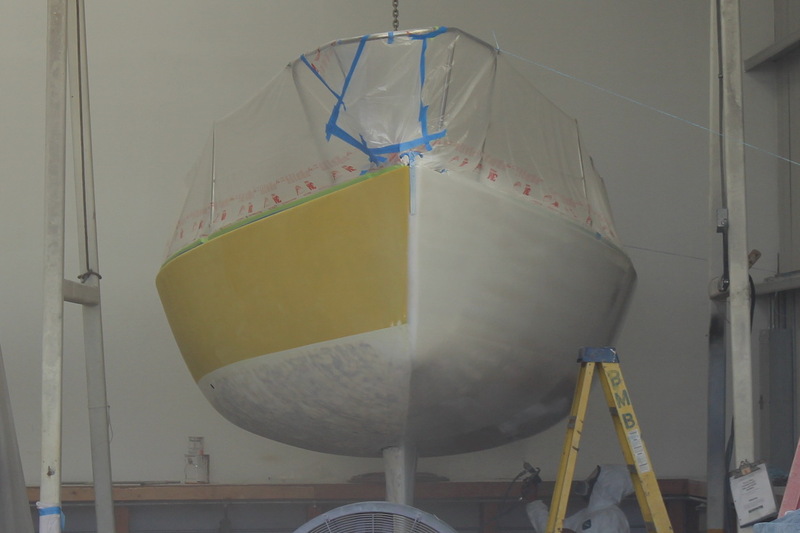 The most dramatic change was in “Ol Yeller”. 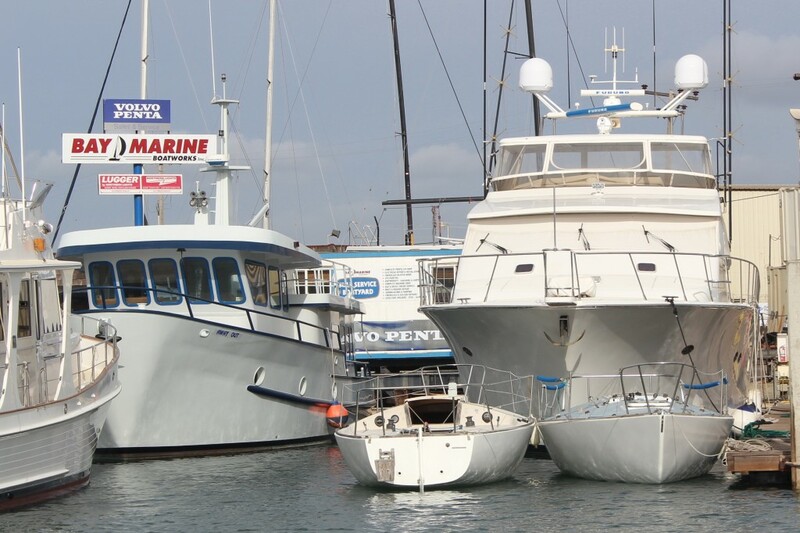 Quite a difference between the before-and-after appearance. The picture on the left was taken during a Life Learning Academy field trip last year. 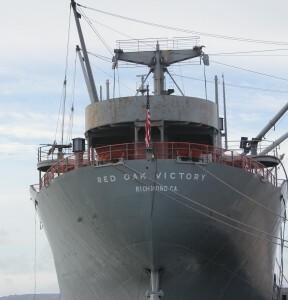 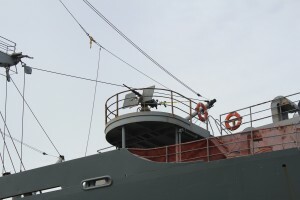 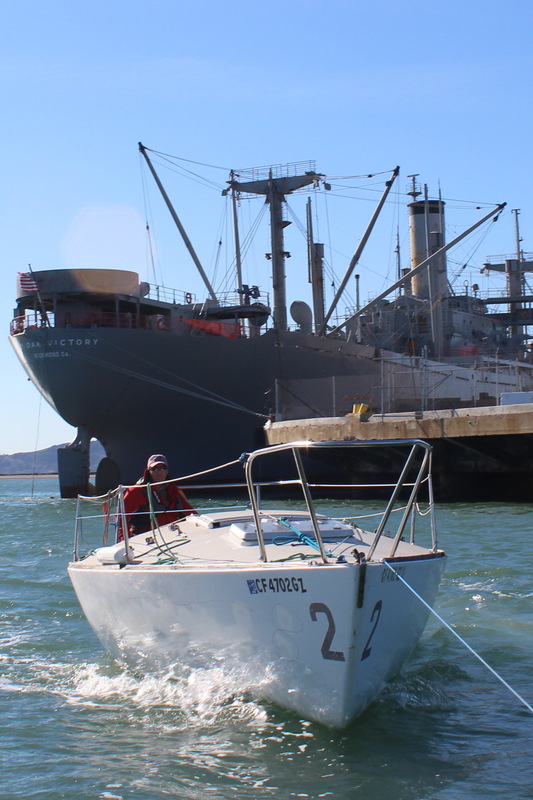 The two below show the progress through the painting process and departing Bay Marine. 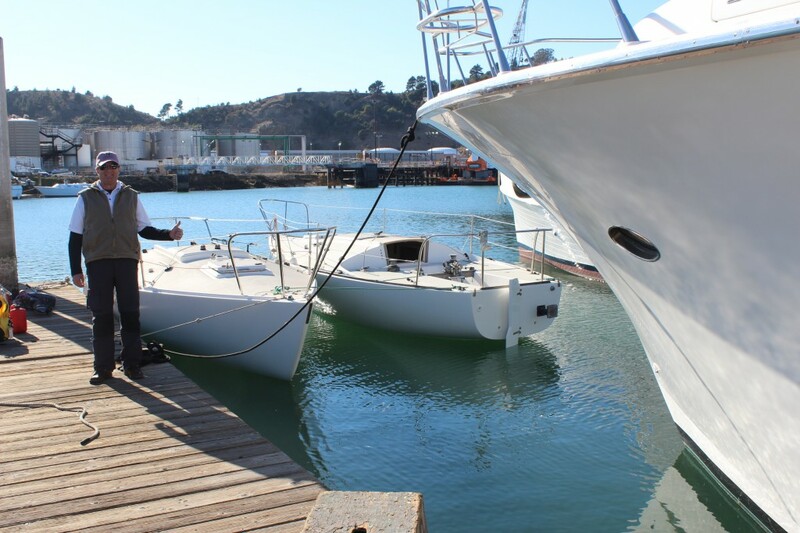 We’re using the same names for our new boats for now. We’re looking for sponsors who might want to see their names or logos on our J/24 fleet. 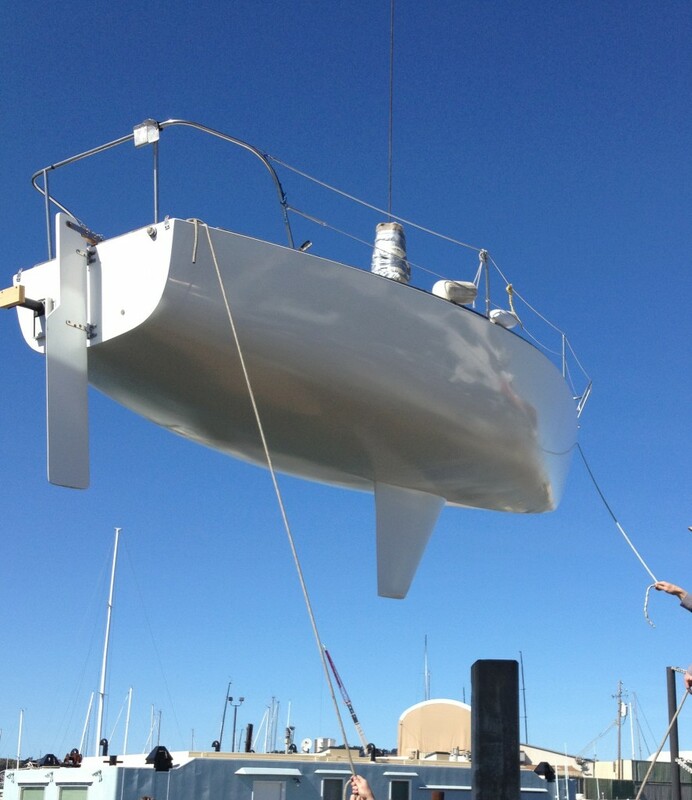 The new look on our J/24s didn’t go unnoticed during opening day last month. 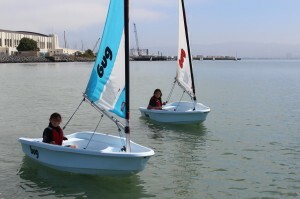 We had a number of compliments, along and a few questions about where our “new fleet” came from. 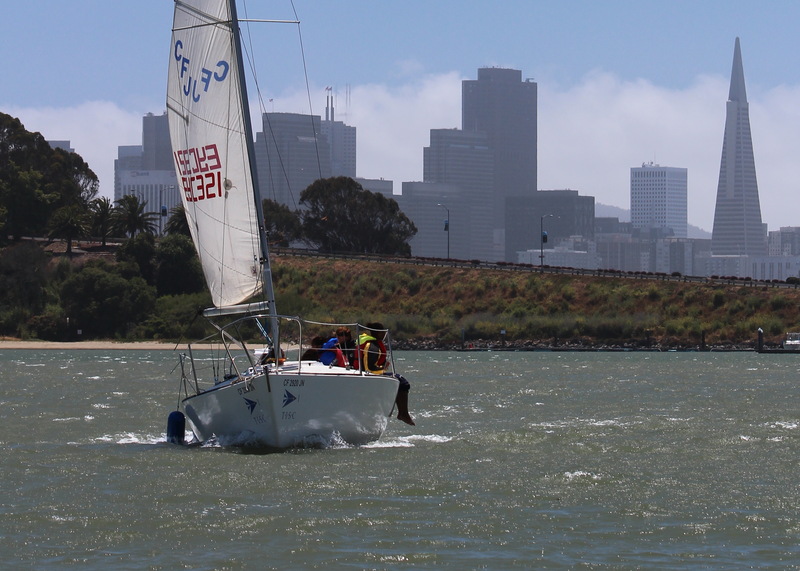 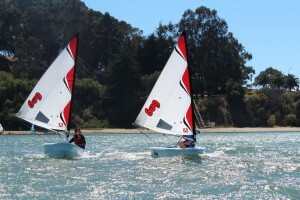 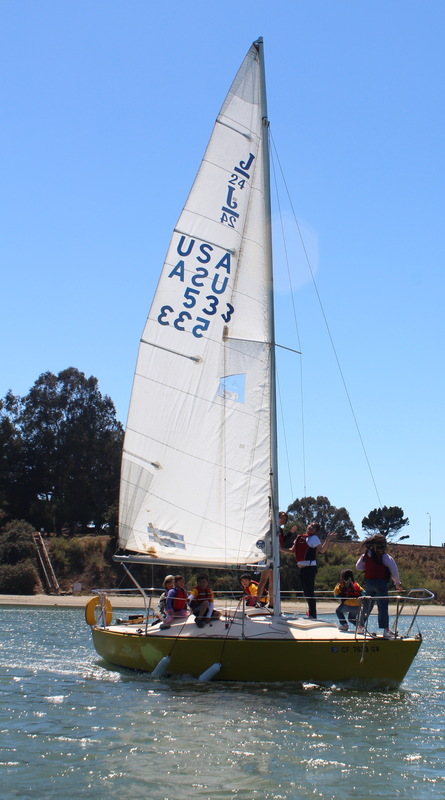 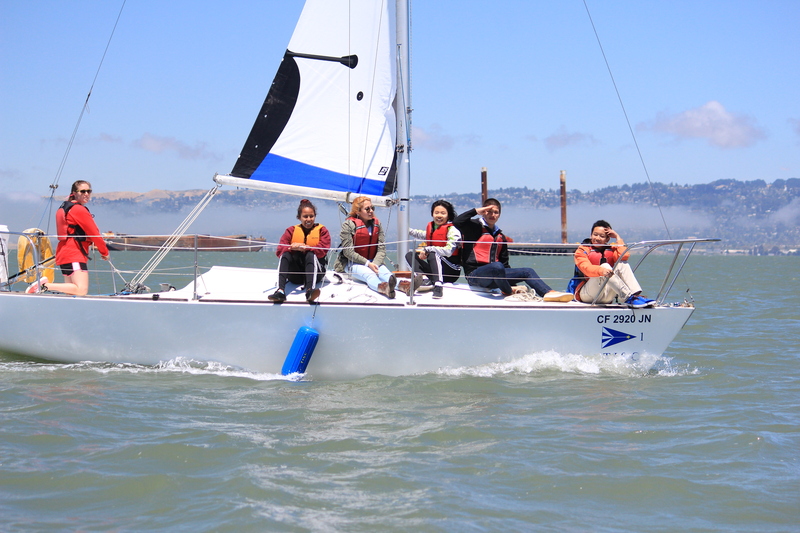 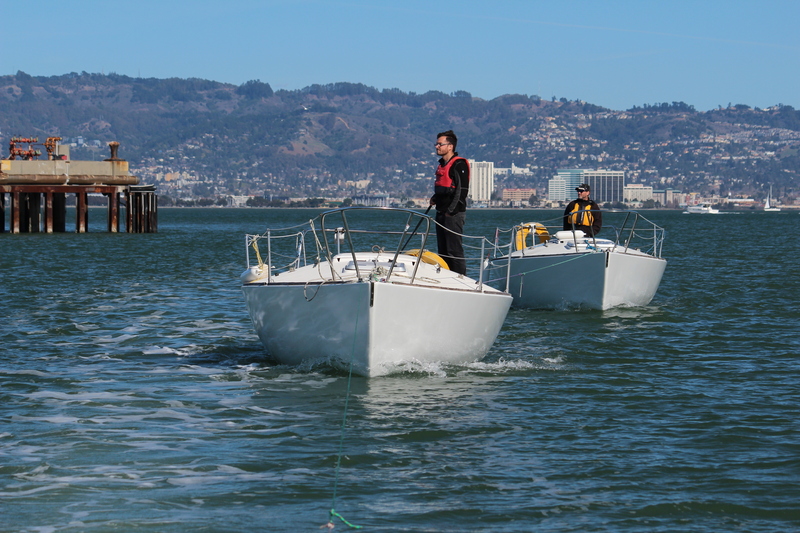 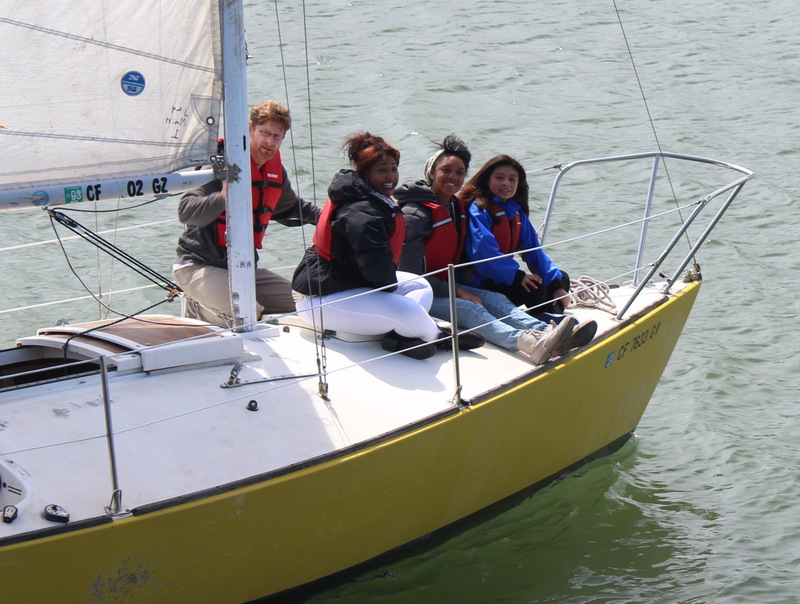 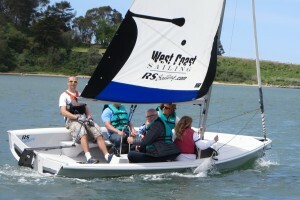 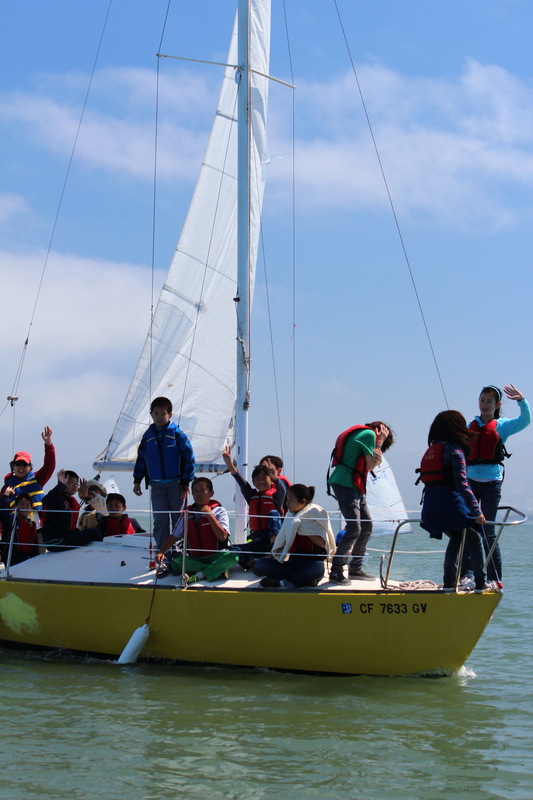 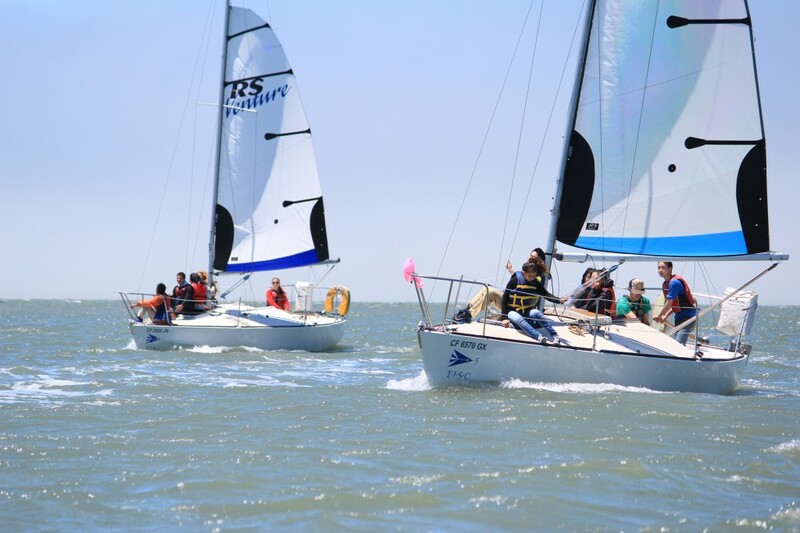 Our J/24 fleet is used for adult sailing and keelboat lessons, and for many outreach programs during the week. 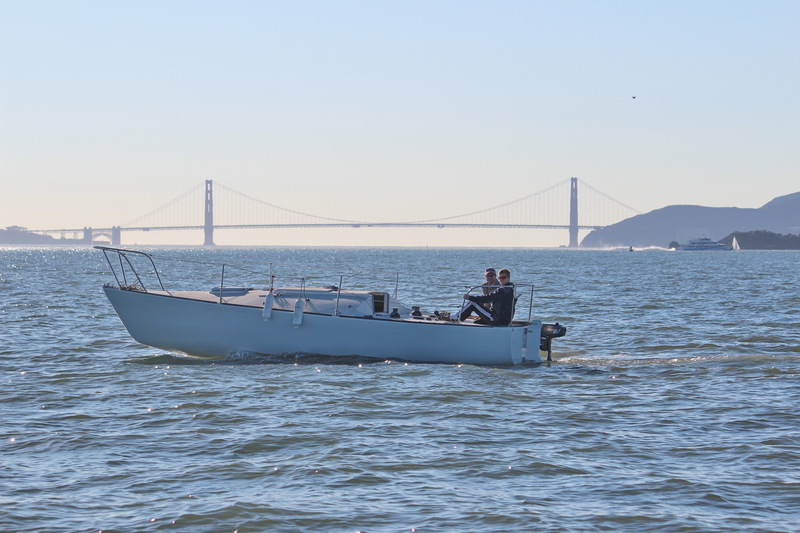 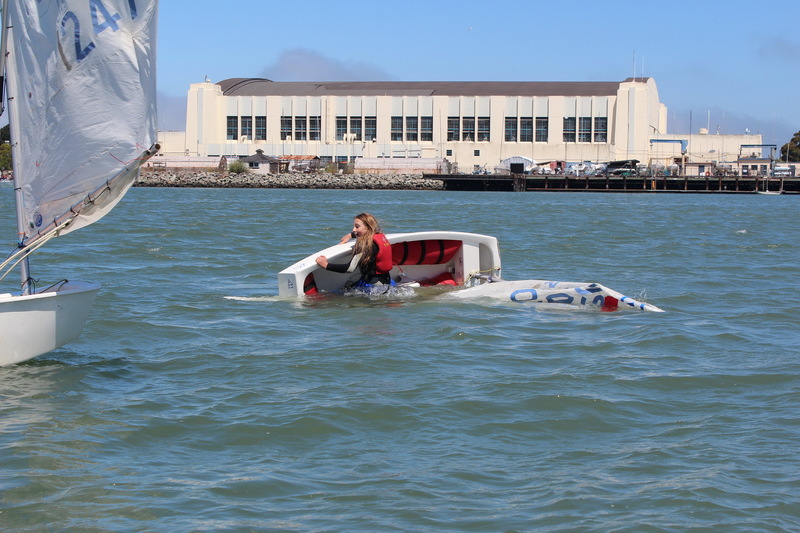 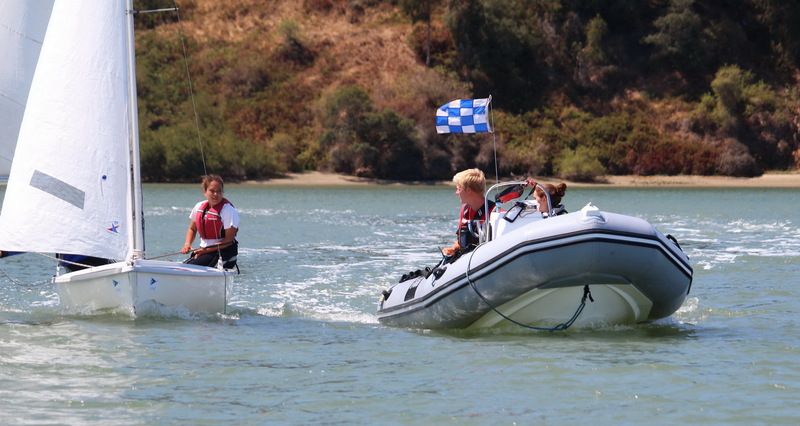 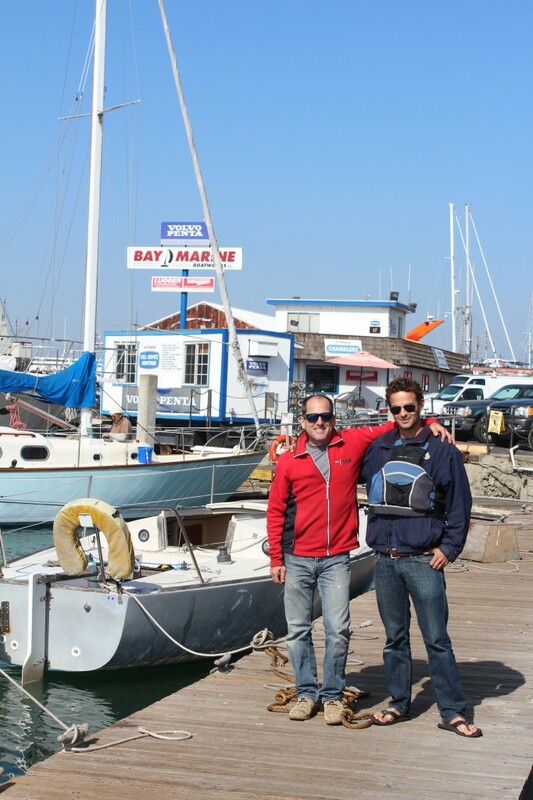 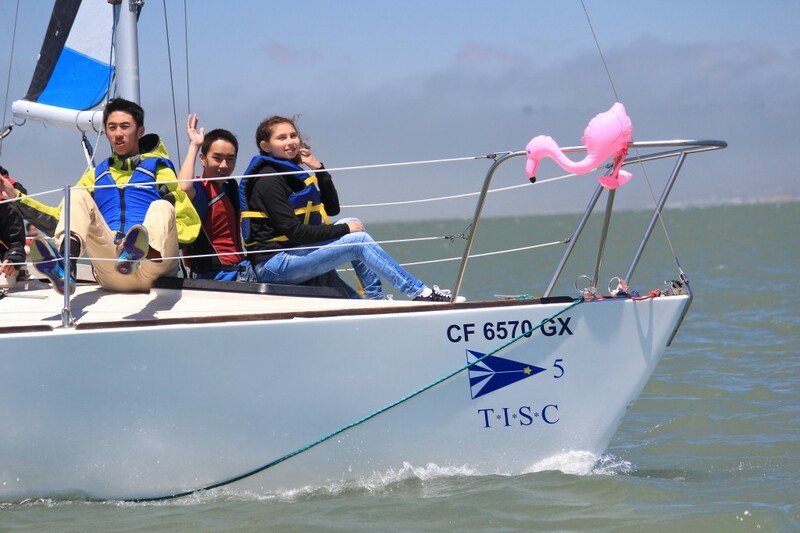 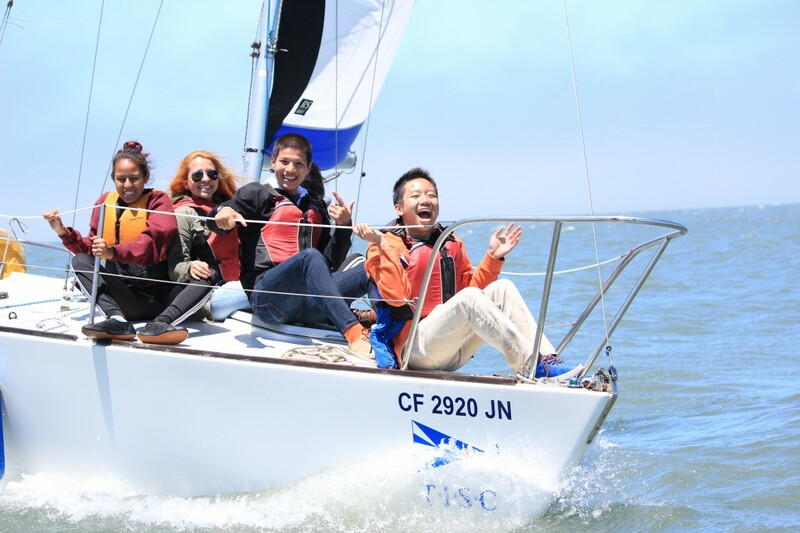 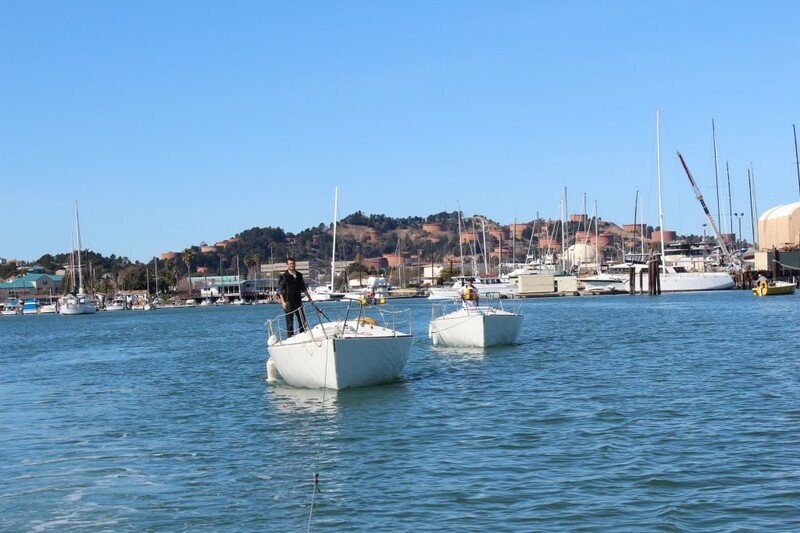 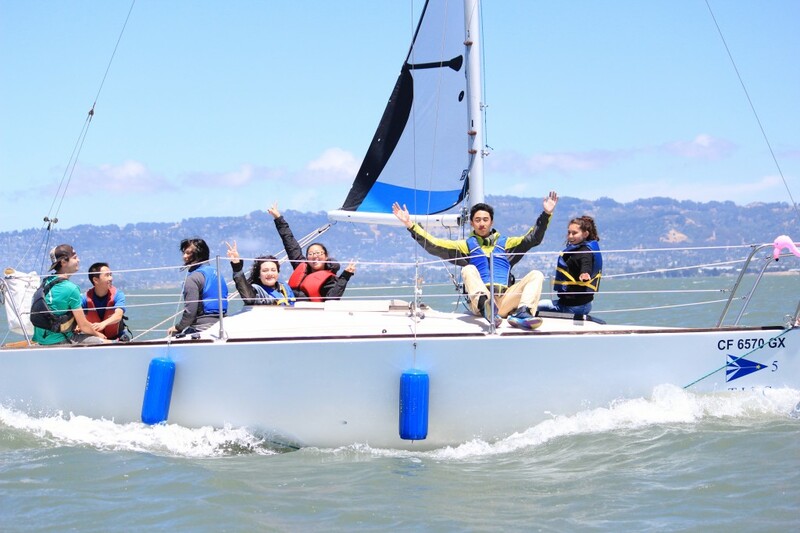 Here are a few smiles from a recent San Francisco Expeditionary School day at TISC, along with our new hulls with Bay Marine Boatworks and graphics from Signarama San Jose. 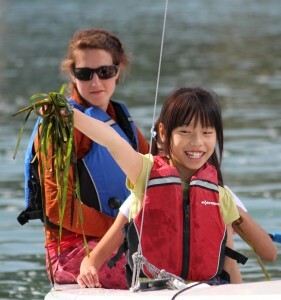 Registration for our Summer Classes starting June 2nd is open. We still have availability in most classes, and are always looking for kids interested in developing life skills while learning to sail and enjoy the water. The registration page for our youth summer programs is HERE. Registration page for all programs is HERE. 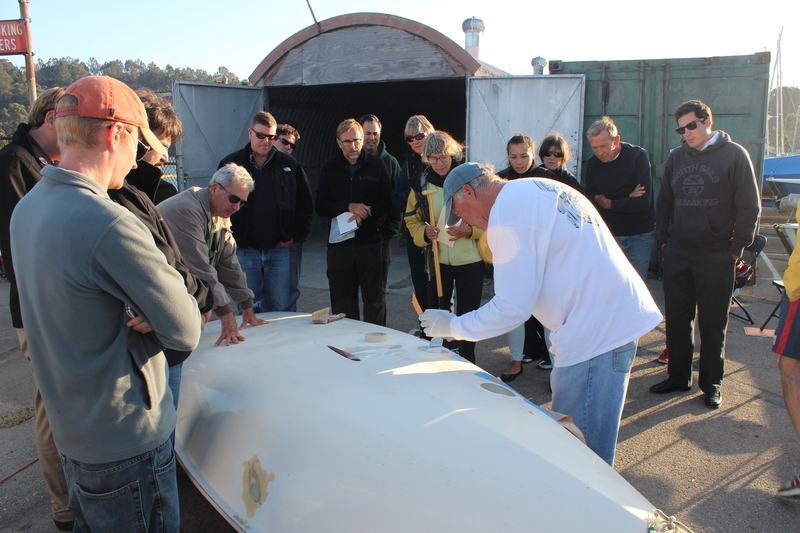 Many volunteers who helped with the J/24 transits fromTISC to Bay Marine and then. THANK YOU ! 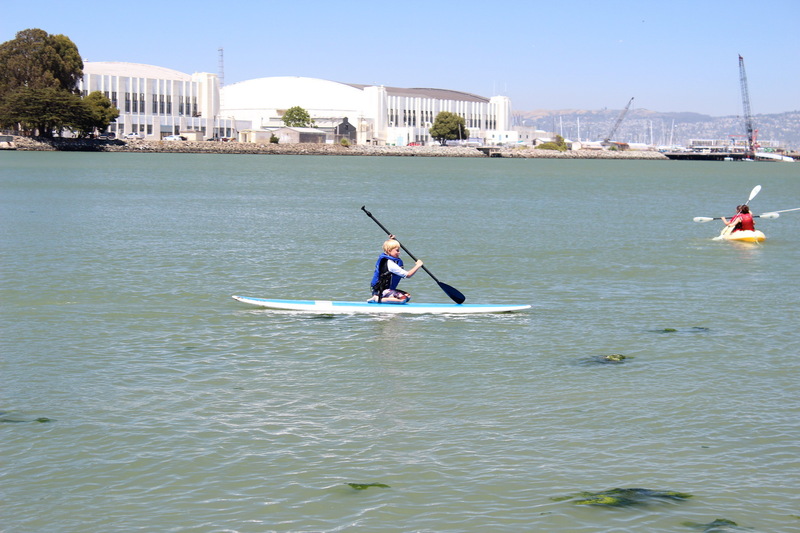 Saturday’s Opening Day Featured blue skies, steady winds, eight sails, a bunch of kayaks & paddleboards, and hundreds of smiles. 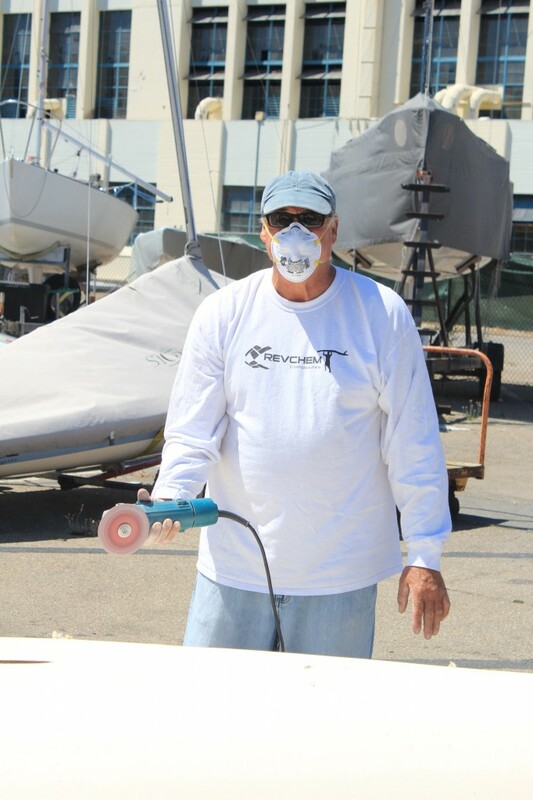 Our supportive volunteer force worked Wednesday through Saturday. 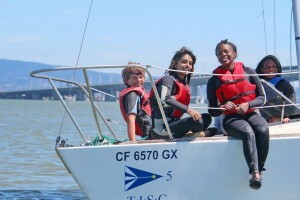 Kudos to our TISC team for a job well done! 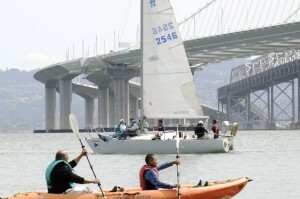 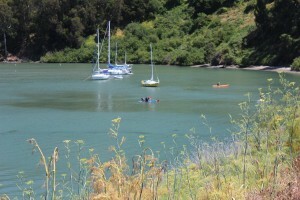 Opening day was combined with Safe Boating Day this year. 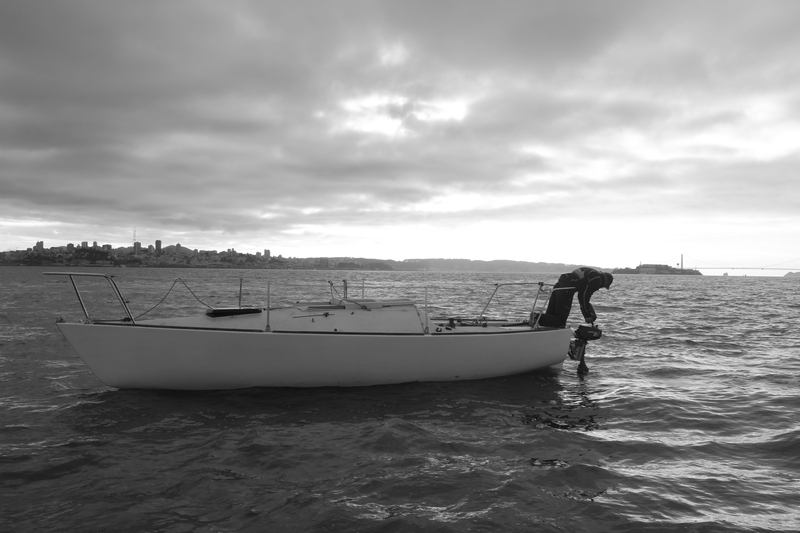 The rain on Friday was unusual however the Cal Sailing Team showed up to finish the set up anyway, then returned first thing Saturday to make sure all was ready and greet visitors. 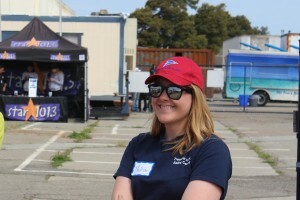 No way this event happens without their dedicated support. 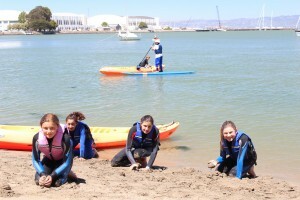 Parents and students also turned out in force to help set up and manage beach logistics. 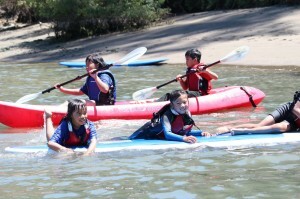 It was great to see them having fun while giving back. Thanks also to the Life Learning Academy volunteers. There are many, many, many moving parts to opening day. 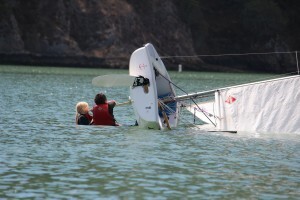 Some happen in real time, some must be ready days, weeks or months in advance. Madison Gattis, our Director of Operations, has been on this since the beginning of the year. 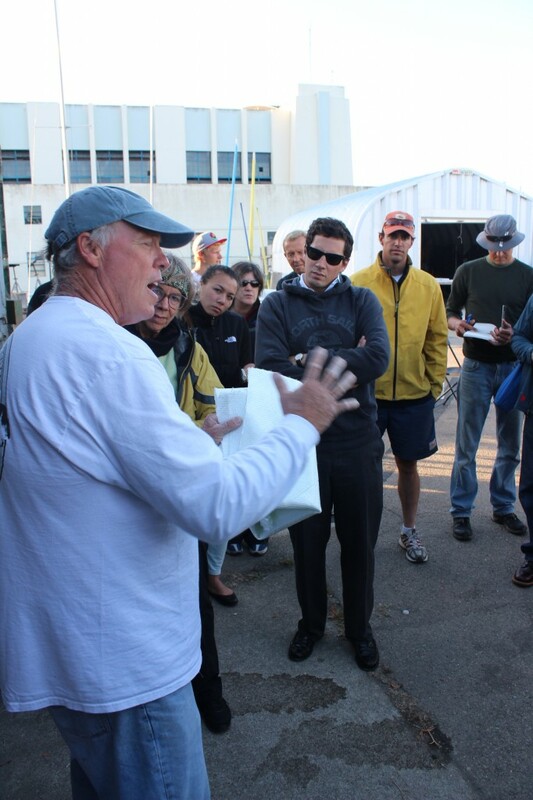 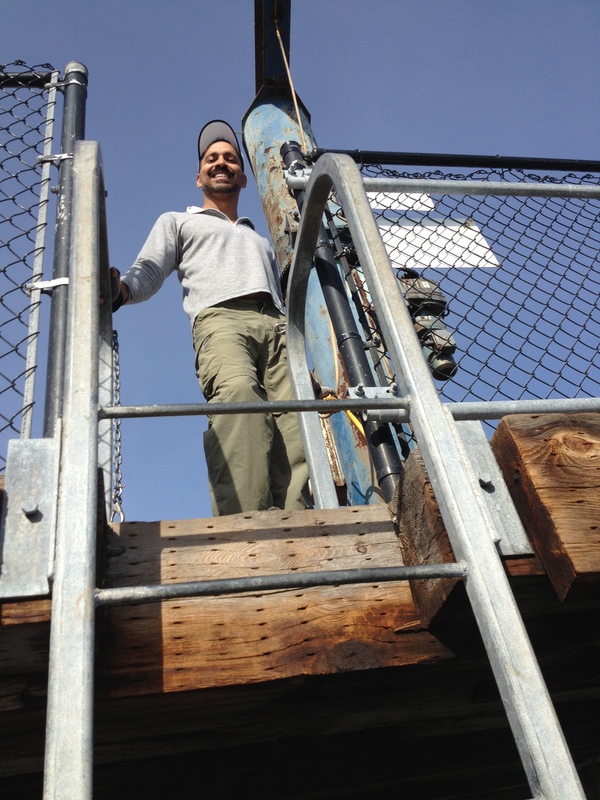 Once the day started Chris Childers, our Programs Director, oversaw the boats, dock workers and hundreds of guests on Clipper Cove. 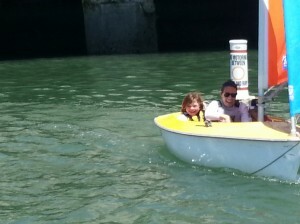 New this year was the use of the west beach for the water toys with launches transporting guests to/from the docks to the beach. 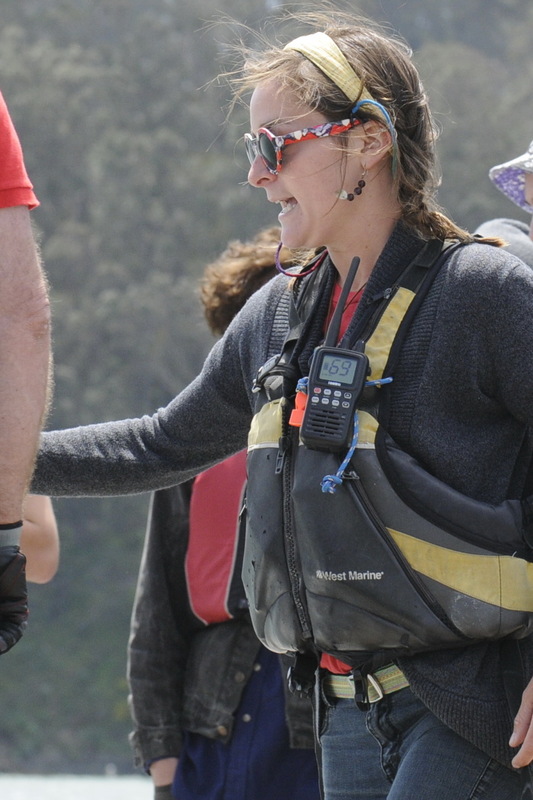 Annie Butts, our Head Instructor, had her hands full with driving, coordinating crash boats and answering lots of volunteer questions. Thanks also for her many hours of boat prep prior to the event. 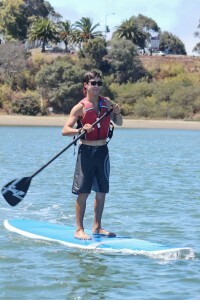 Staging the paddleboards and kayaks at the beach and using launches to ferry people to and from was a great idea. 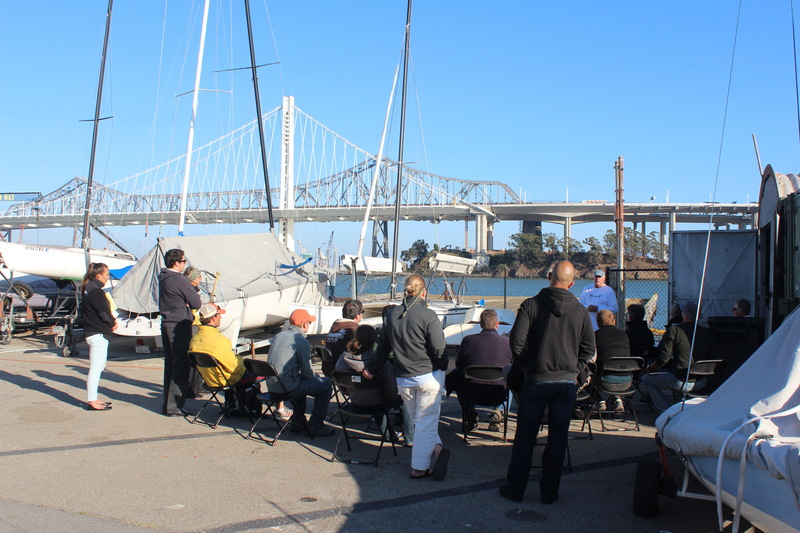 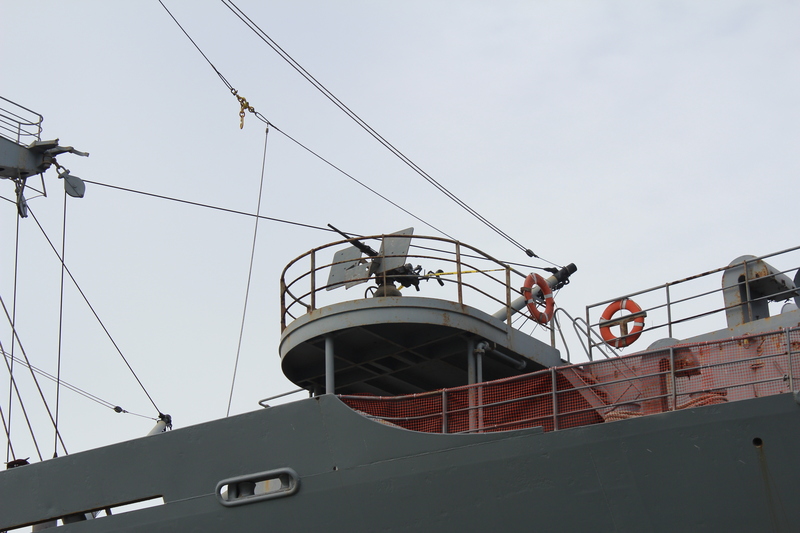 This plan provided a completely separate venue and afforded a different view and experience for non-sailors. Not everyone came to sail, yet everyone enjoyed being on Clipper Cove. 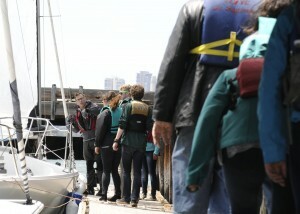 Here again, volunteers were in place to help ensure safety. 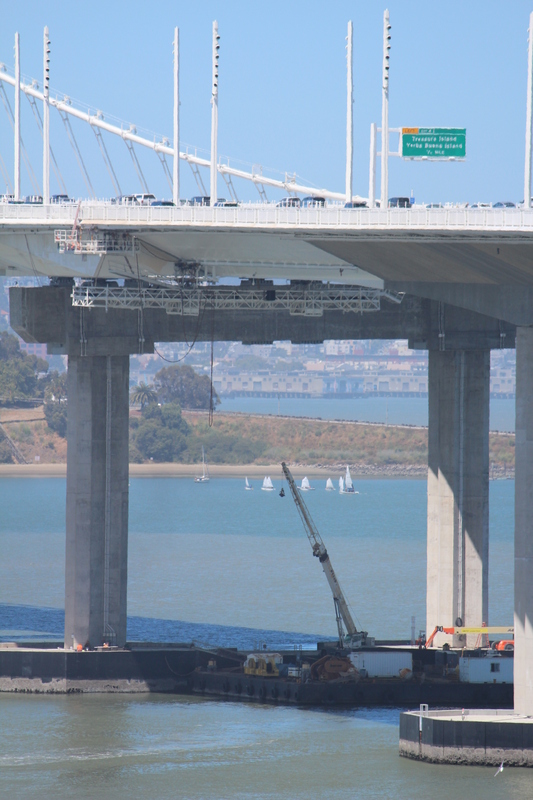 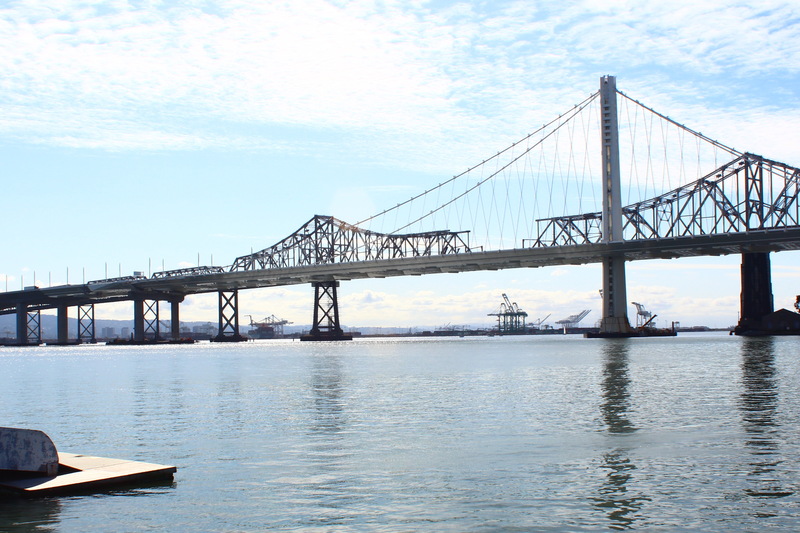 The old Eastern Span of the Bay Bridge is being deconstructed. 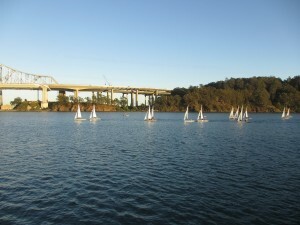 You can see the initial gap which will continue to widen over time. The highlights of the day were the huge smiles, compliments, high-fives and sincere thanks from the many guests (we stopped counting sometime after 500) who attended Opening Day 2014. 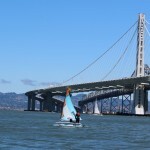 Some were repeats from last year; many were new to Clipper Cove and wanted to bring their families out for awesome time on the water courtesy of Treasure Island Sailing Center. Four sail boats departed the docks every fifteen minutes from 11:30 until 3pm. 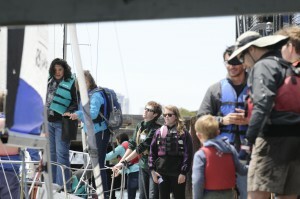 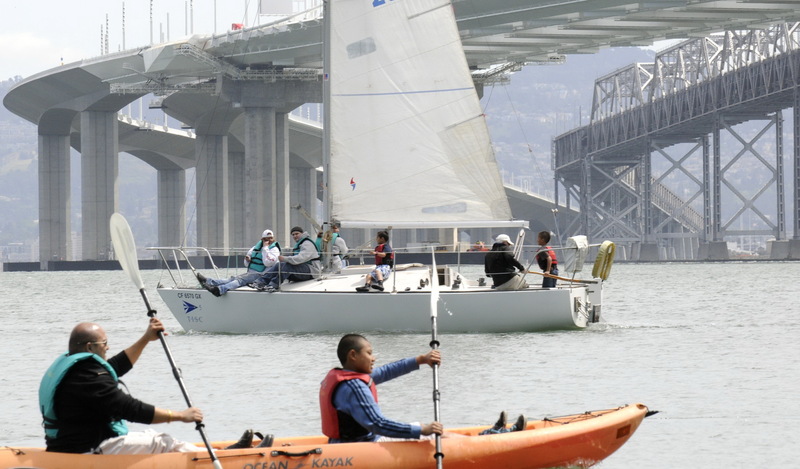 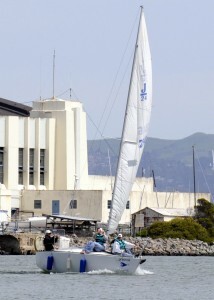 Do the math; that’s over 300 opening day sailboat rides. 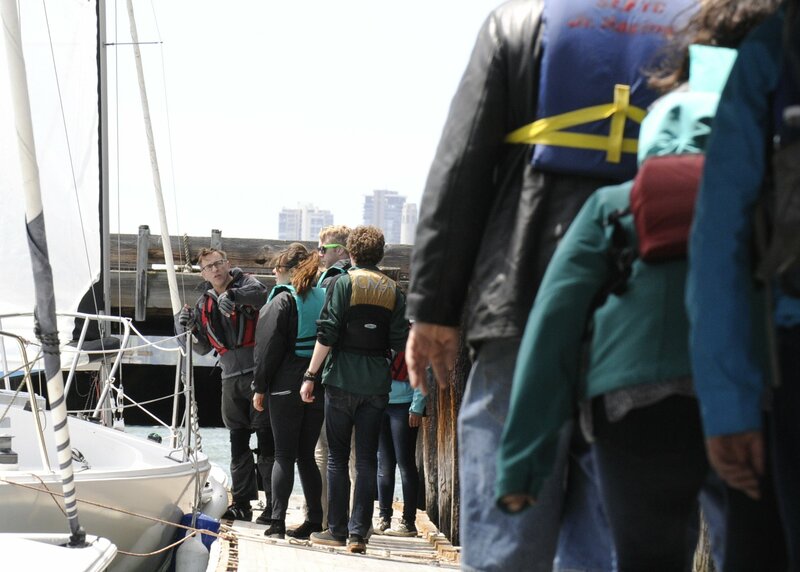 Our volunteers registered all these people, gave them a safety briefing, fitted life jackets and escorted them to and from the docks for embarking and disembarking the five J24s and three RS Ventures. 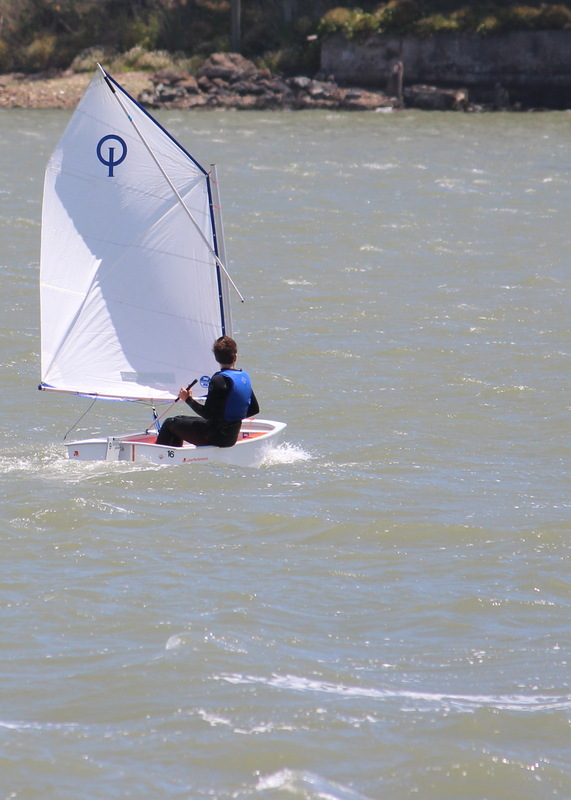 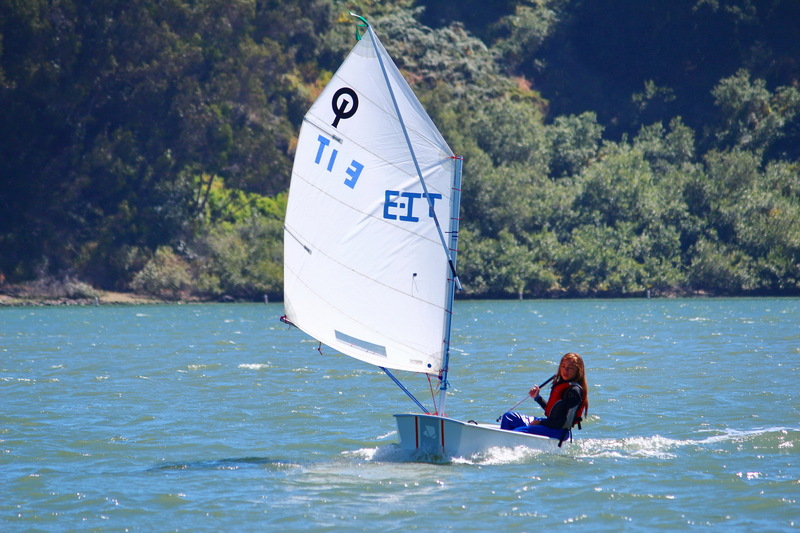 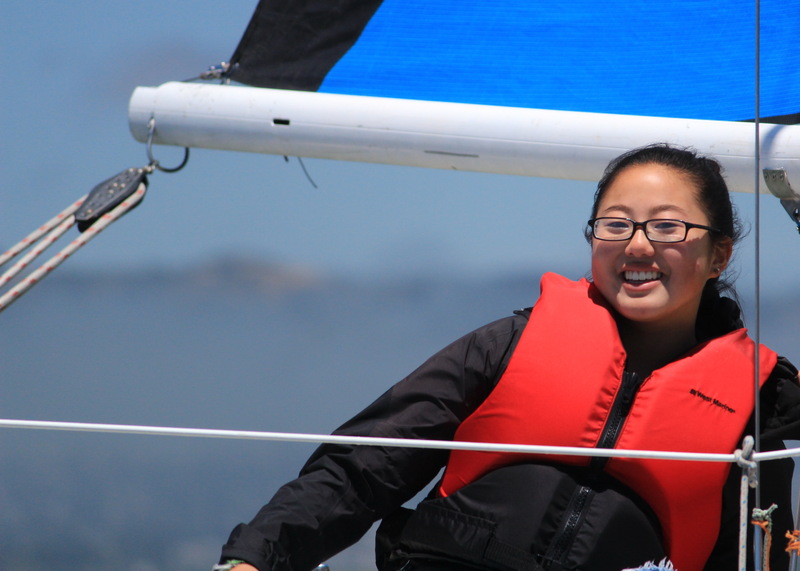 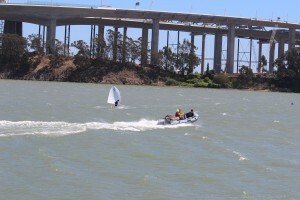 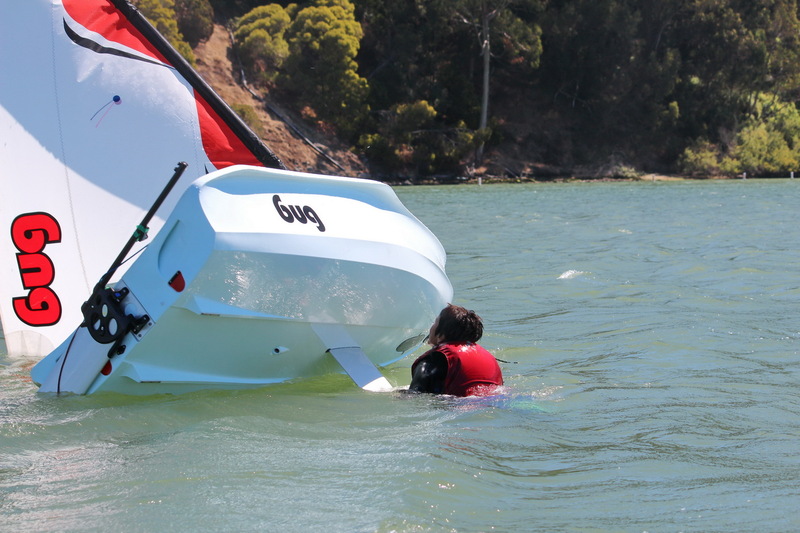 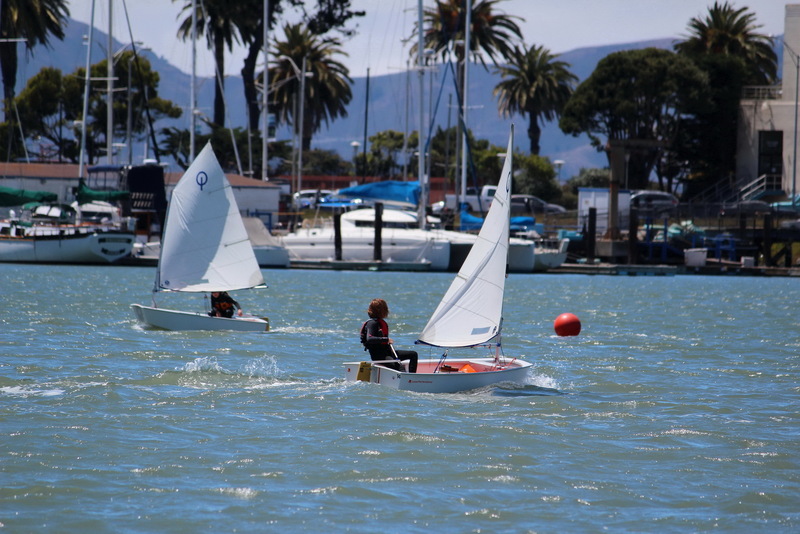 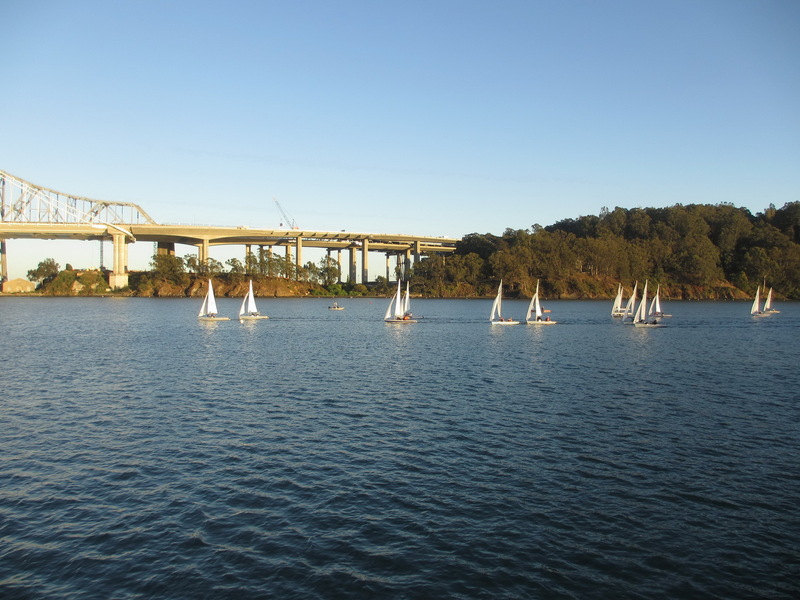 Many thanks to the TI Vanguard and Laser fleets, Cal Sailing, TISC tenants, and Bay Area Association of Disable Sailors for keeping managing the constant flow on the ramps and docks. 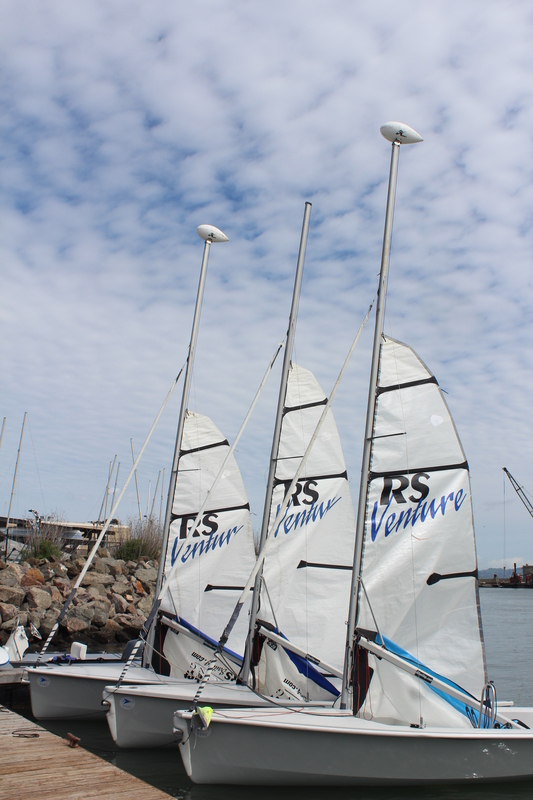 Special thanks to the V15 and Laser sailers for setting up the tent (and taking it down tomorrow). 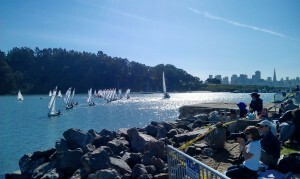 Mother Nature favored us with a gorgeous day. 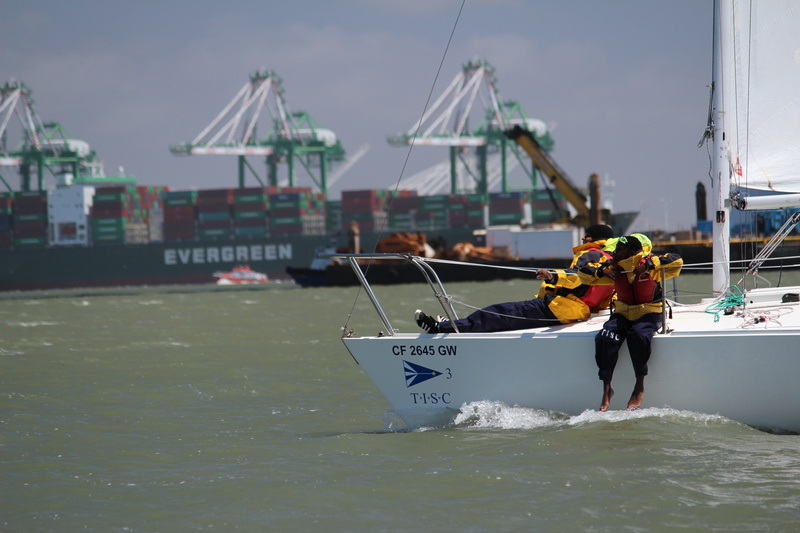 Rather windy toward the afternoon, which put an even higher premium on the efforts from Cal Sailing team who helped with dock logistics the entire day. 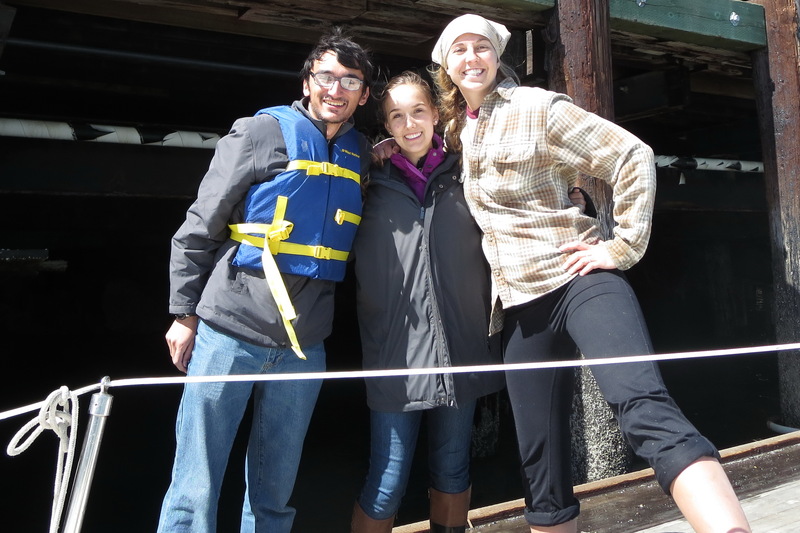 Here are three smiling faces who greeted just about all my guests; this was taken after my last trip – they’re still smiling! 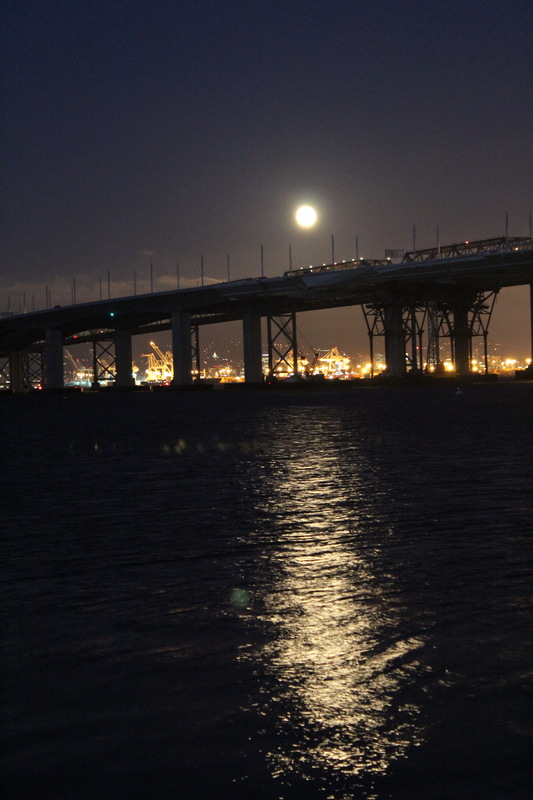 Many of the great pictures above, including the first which captured the variety of the day framed by the new Bay Bridge Eastern Section, were courtesy of Valerie Santorini from Golden Gate Yacht Club. 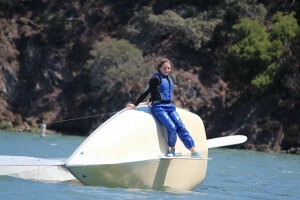 She and other GGYC volunteers spent the entire day On Clipper Cove ferrying guests from the dock to the beach while taking great pictures. Thank You Val !! 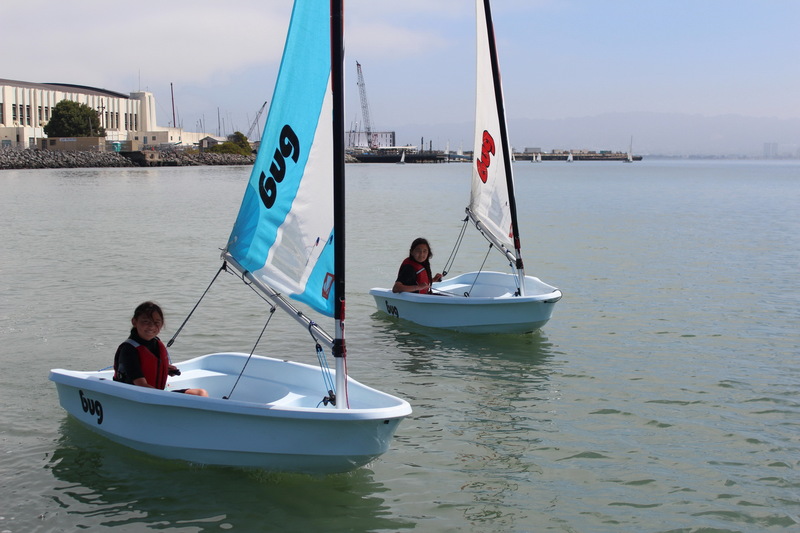 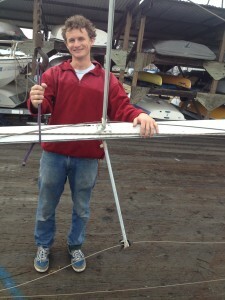 Thanks to supportive donors and generous grants our J/24 fleet has grown to seven. 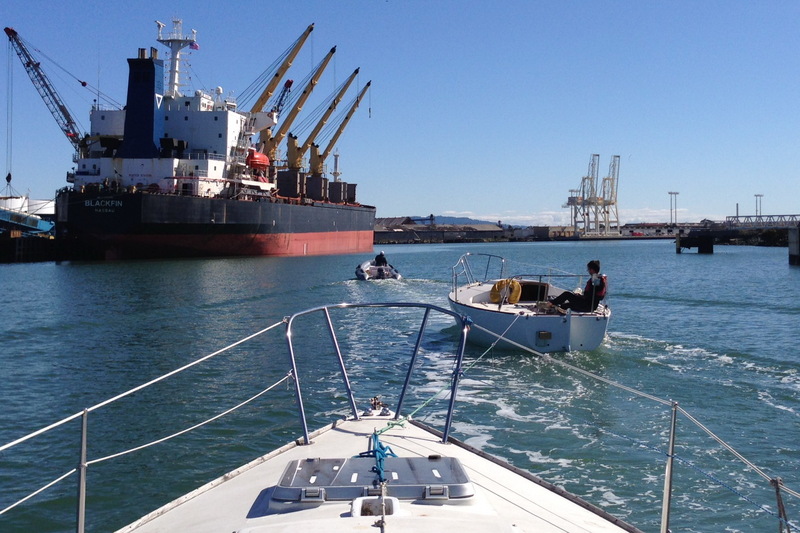 Because of volunteers like Michael, Nigel and Sam, Delos and Barney headed for Pt. 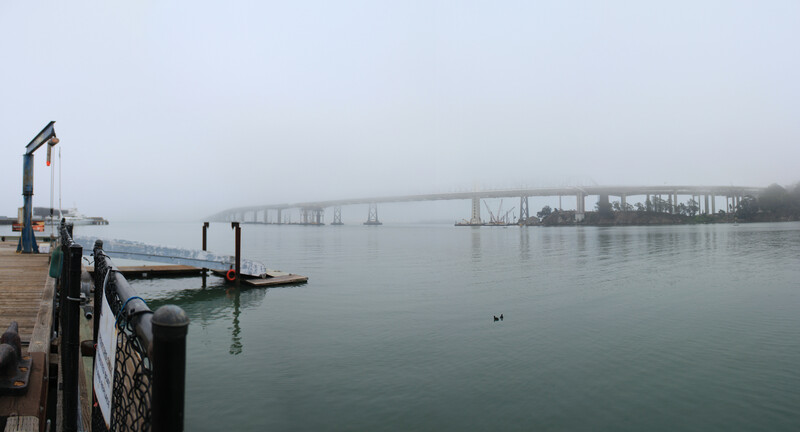 Richmond in yesterday’s fog. 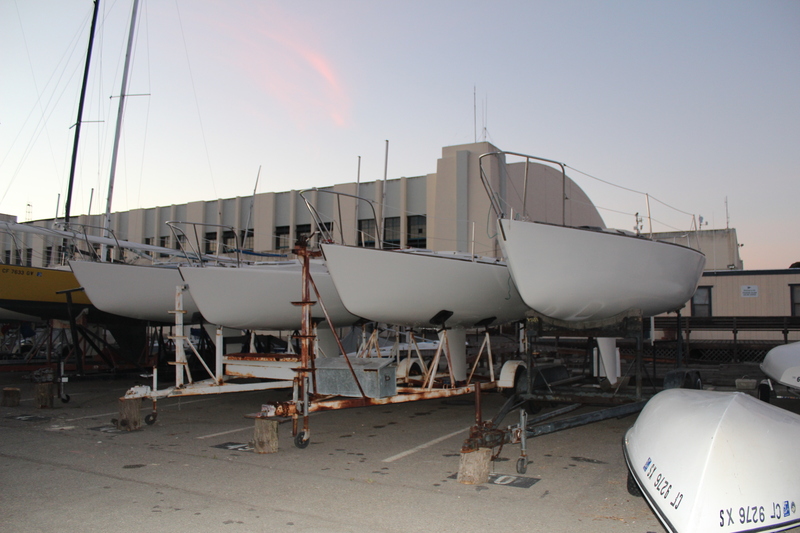 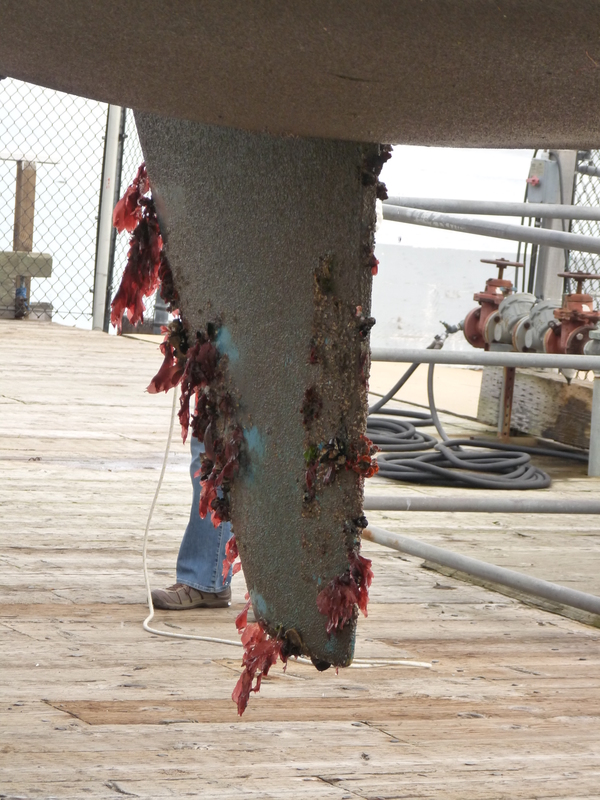 They’ll look new after Bay Marine Boatworks finishes. 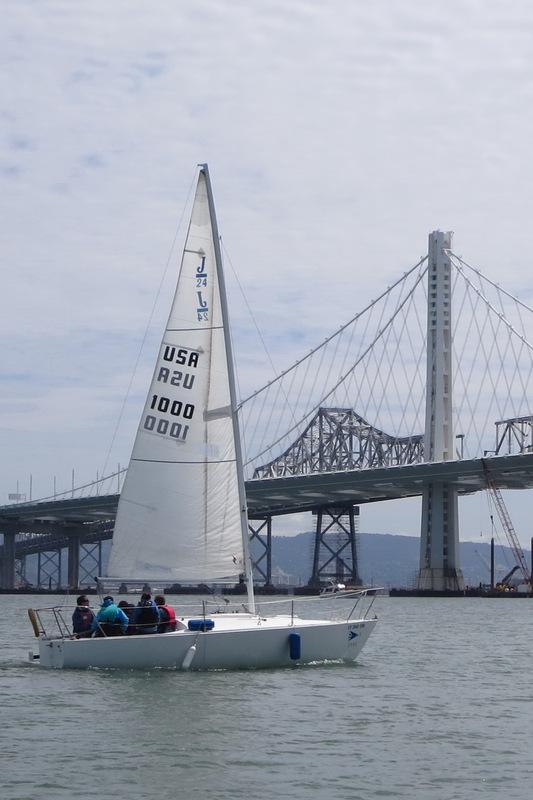 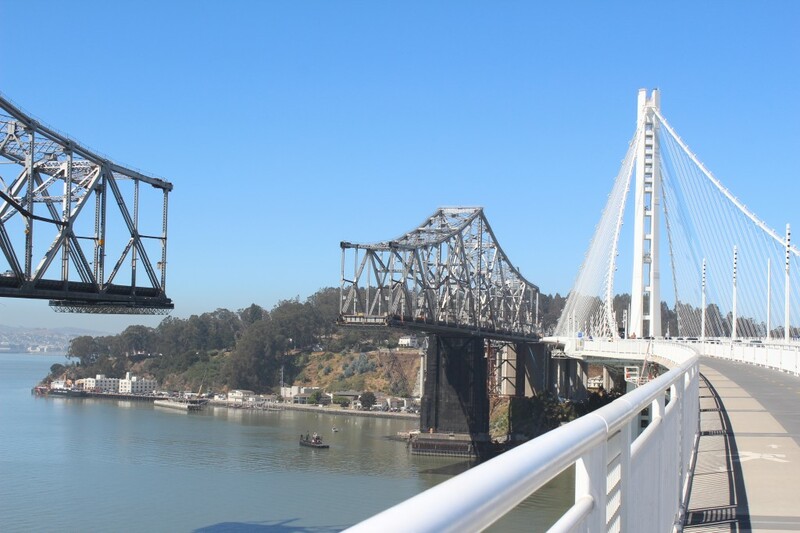 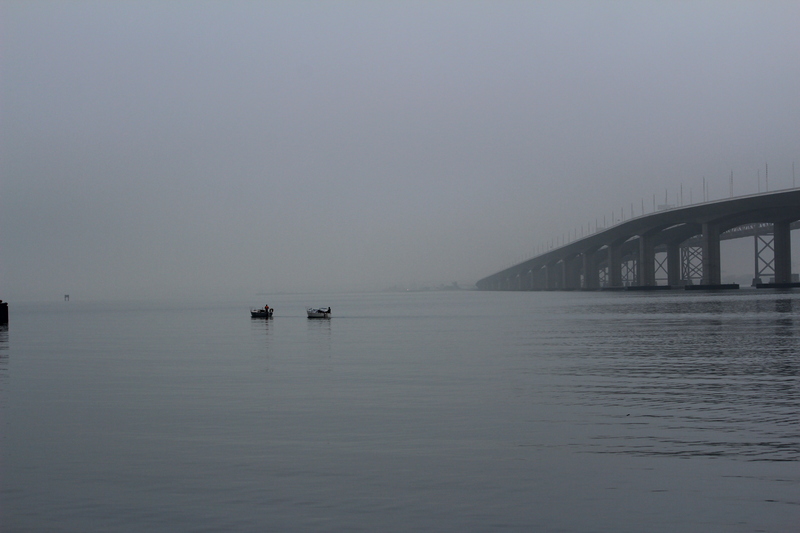 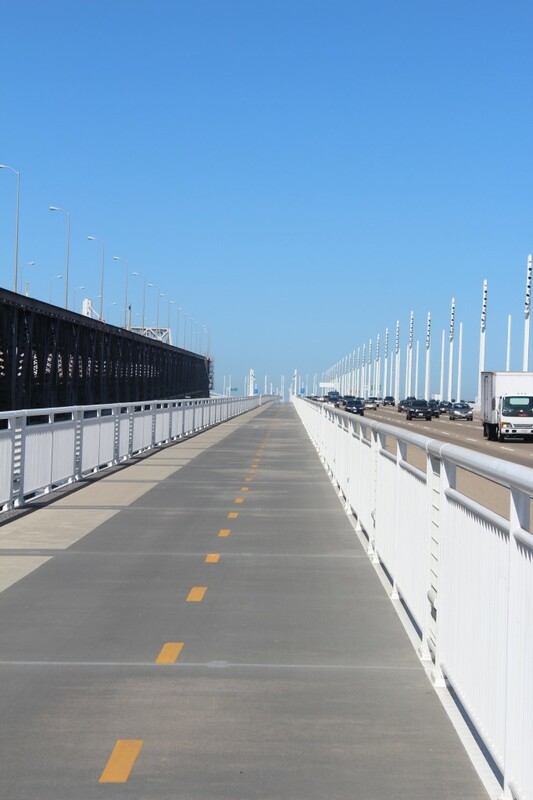 As we drove over the new Bay Bridge back to TISC after delivering two J/24’s and a trailer to Bay Marine I was struck by the number of people and organizations who made this first step in our fleet renovation possible. 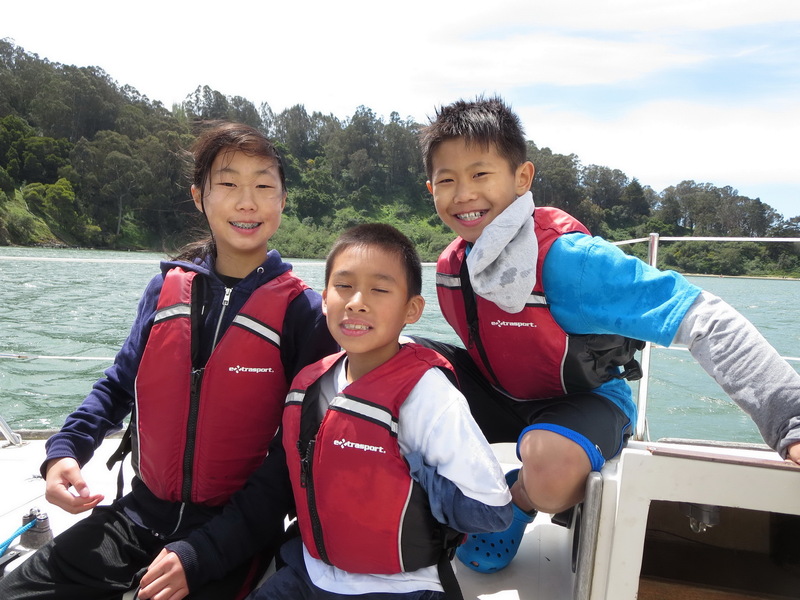 As always the beneficiaries of their generosity are kids in our summer youth classes, year-around outreach program, and just-started SS Learn program. 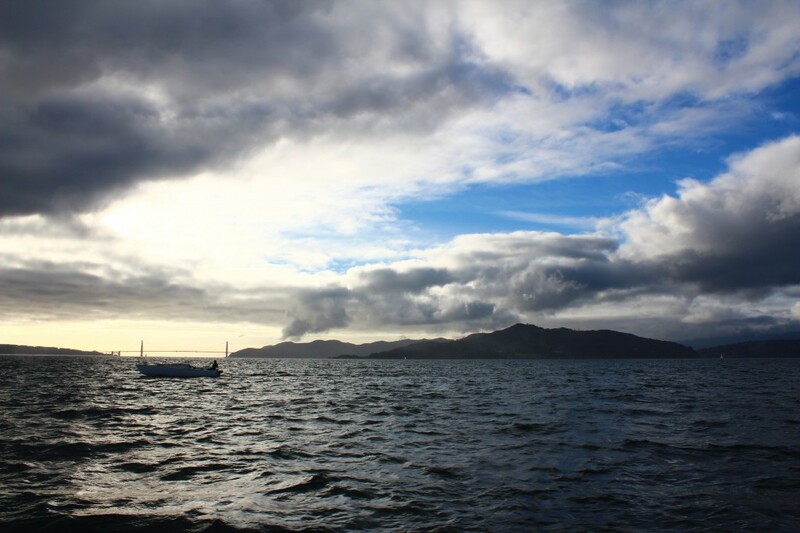 Delos arrived on New Year’s Eve 2009. 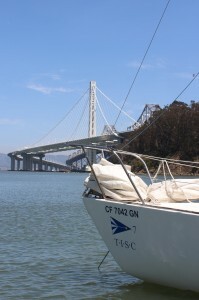 I remember the ultra high tide as we motored from Marina Green to TI, arriving to a Bay Bridge still very much under construction. 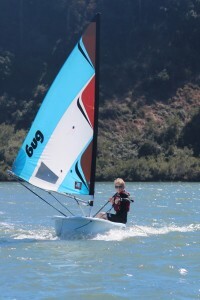 The motor donated by Adam Slote and the trailer from RIch Jepson at OCSC are still key ingredients to our fleet. 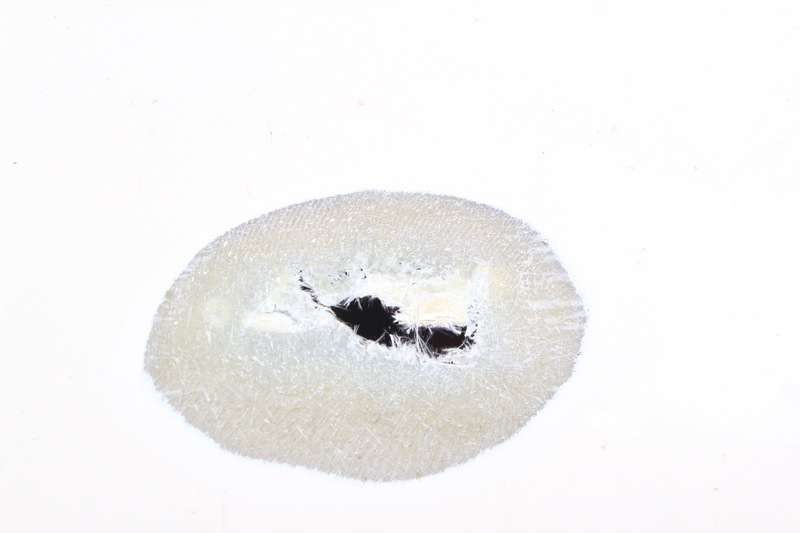 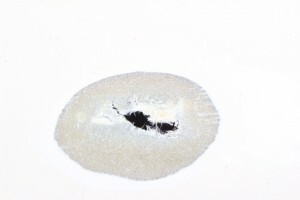 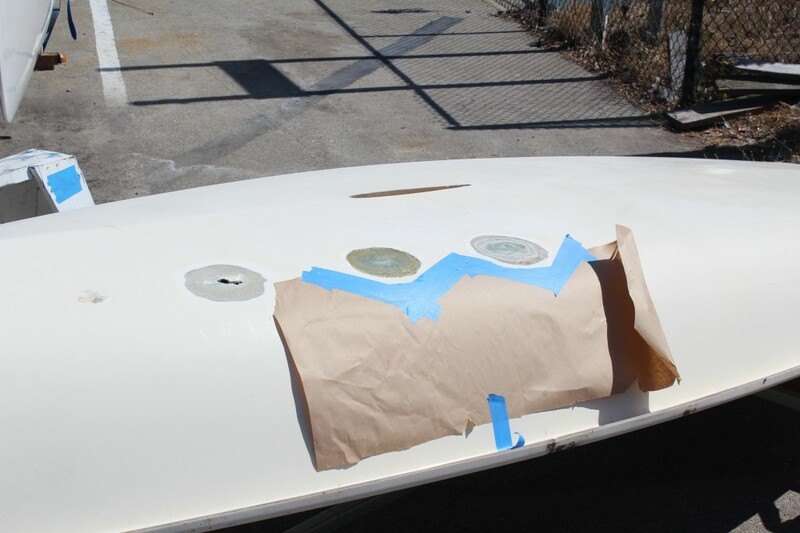 While the bottom growth on Delos was not as populated with marine growth as we found on Barney, it did take some serious scraping to remove it. 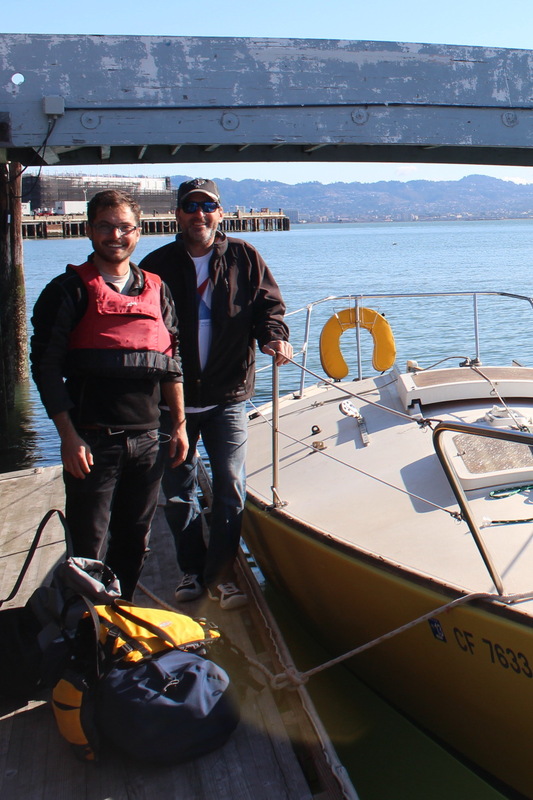 When I asked Michael Weinman to help with our transit to Richmond, I made sure he knew this was a fun “messing about in boats” job, not the grungy job he signed up for when Barney arrived. 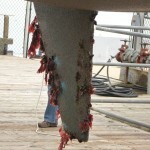 You may recall that clean up job from a previous blog. 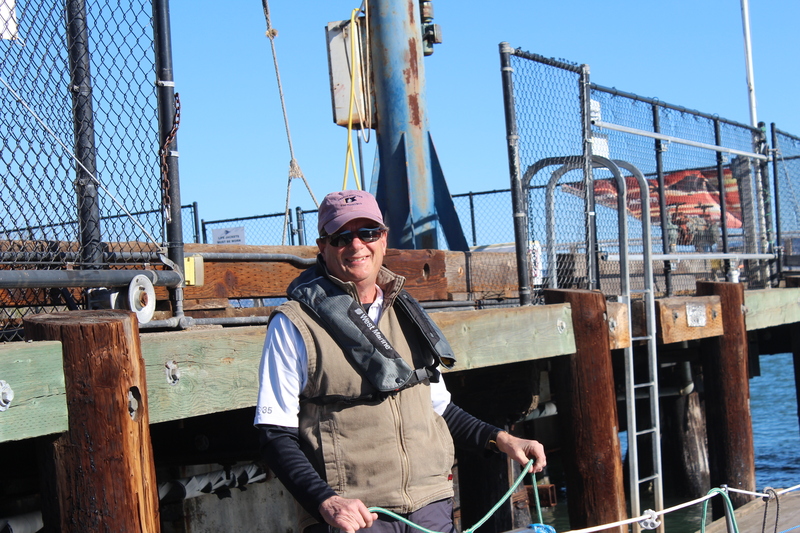 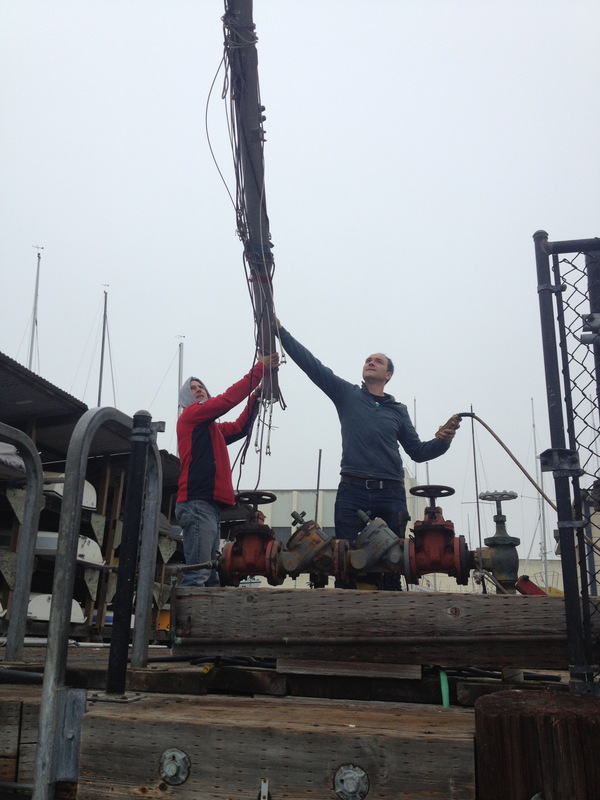 Nigel Tunecliff showed up early Wednesday to help get boats launched and masts out.. We decided to use the 1-ton crane rather than ginn-poles, and with the tide rather low all proceeded smoothly after coaxing a few turnbuckles clockwise. 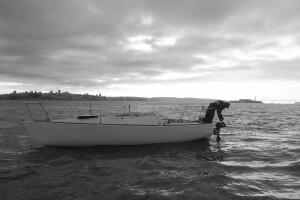 Michael arrived right on time just as we removed the second mast..
With Delos and Skipper’s Gift motors mounted, Michael and Sam Warner got under way slightly behind schedule after a rudder switch on Delos. 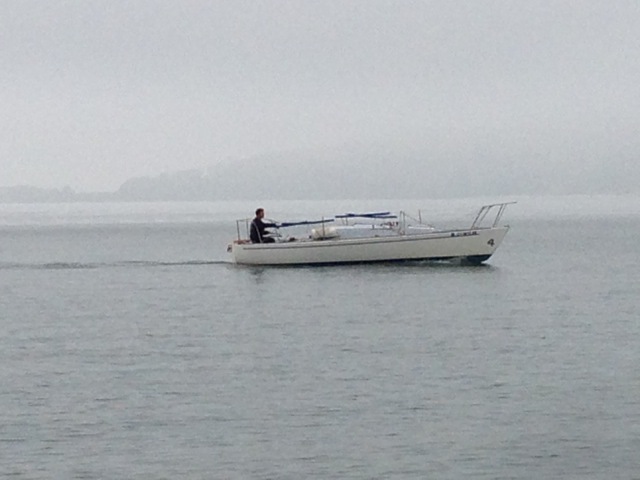 While starting to lift, the fog was still very much with us as they headed into a rather gray bay to “Red 6” just outside the Richmond Break wall. 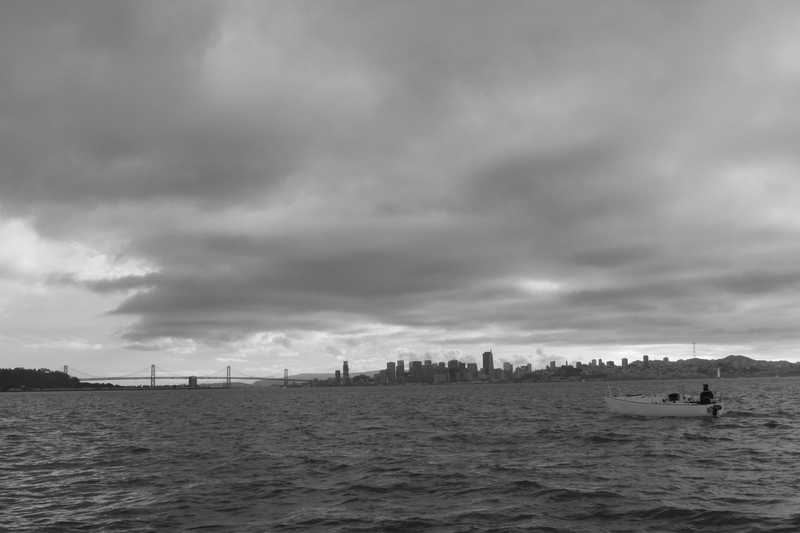 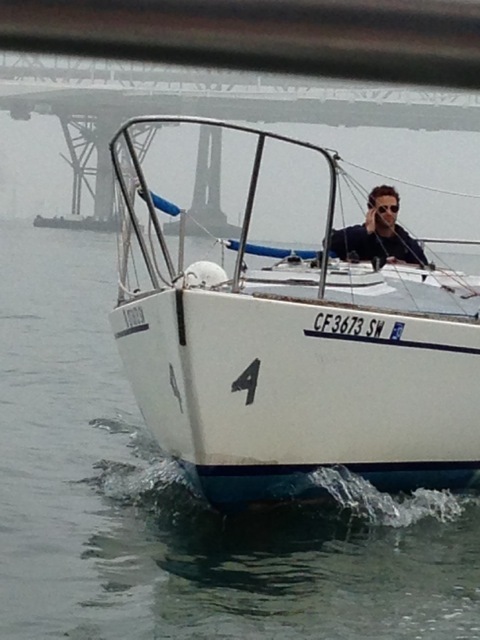 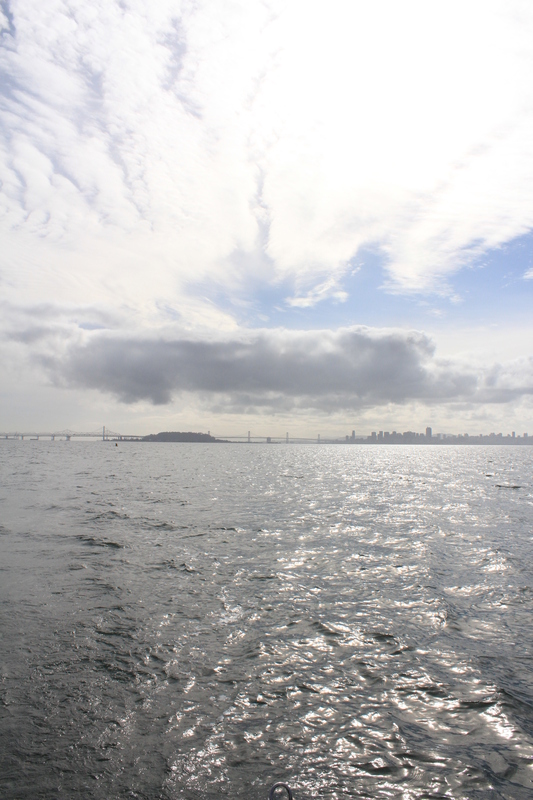 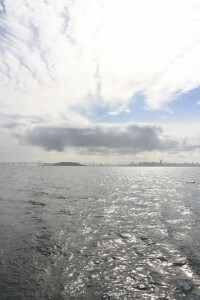 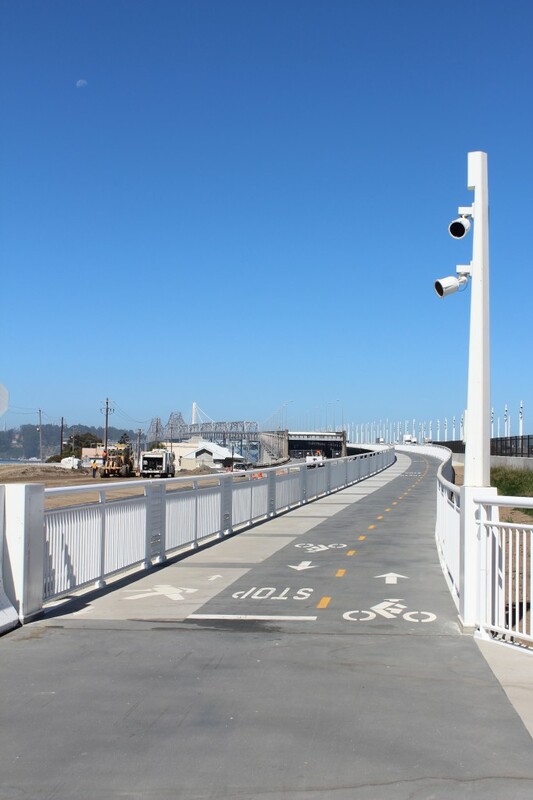 Michael took these two pictures after they turned north at Pier 1 and as they ghosted past Angel Island. 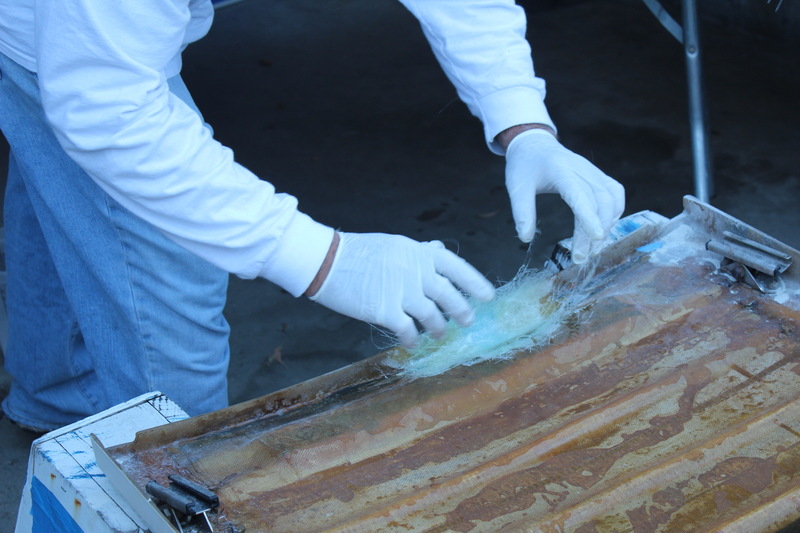 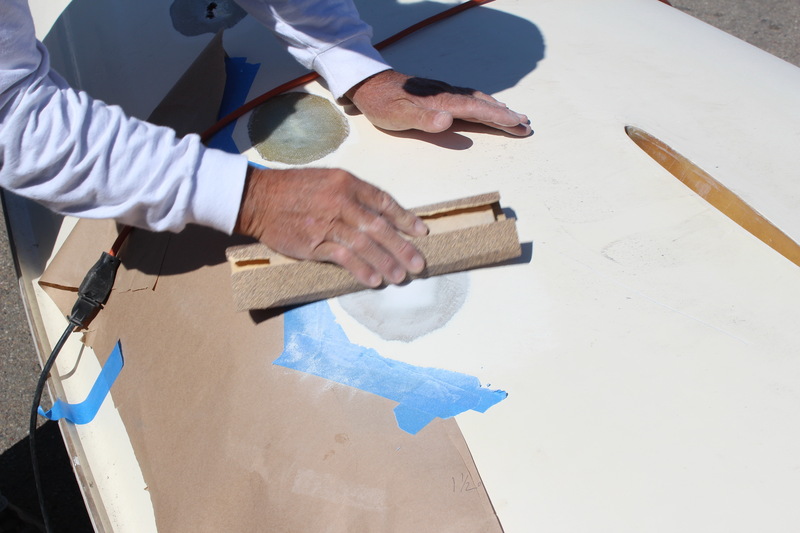 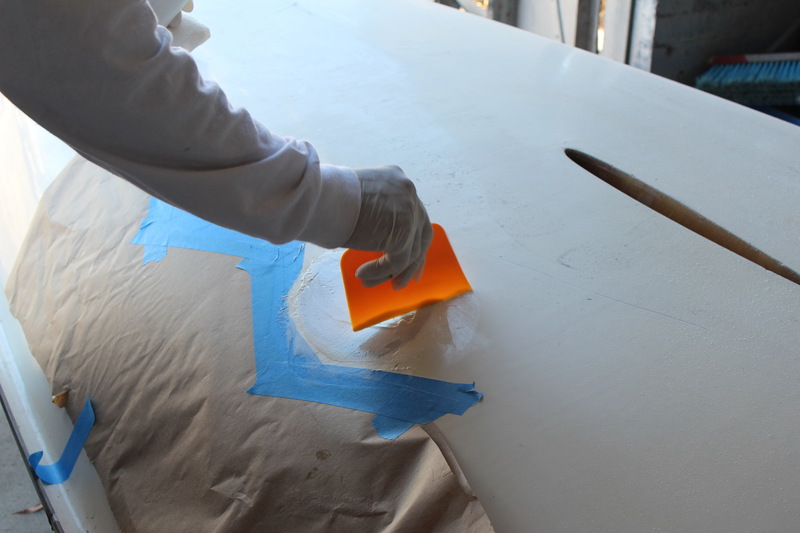 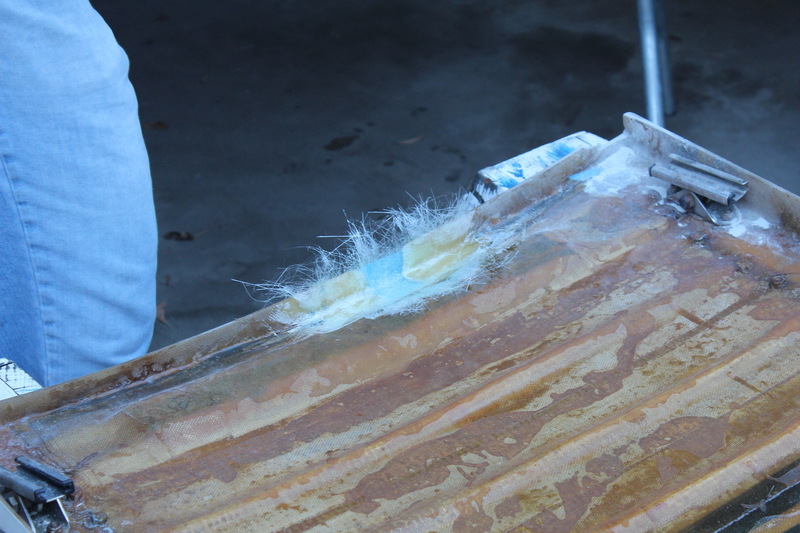 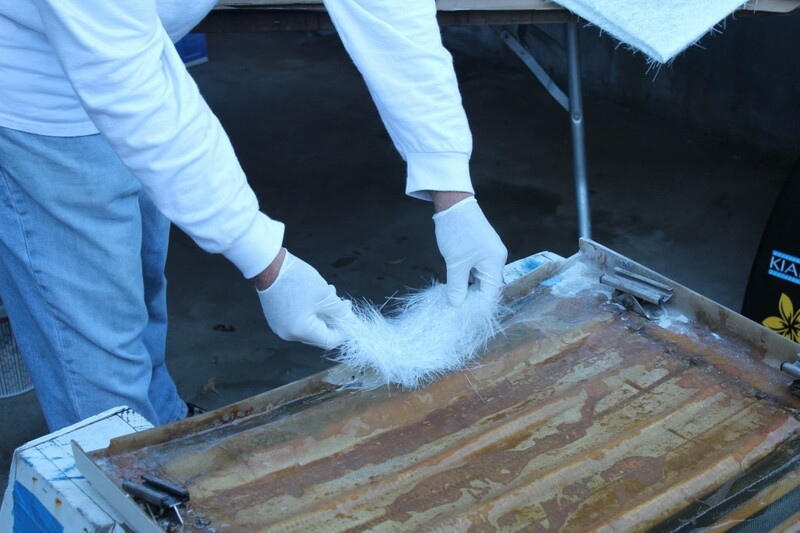 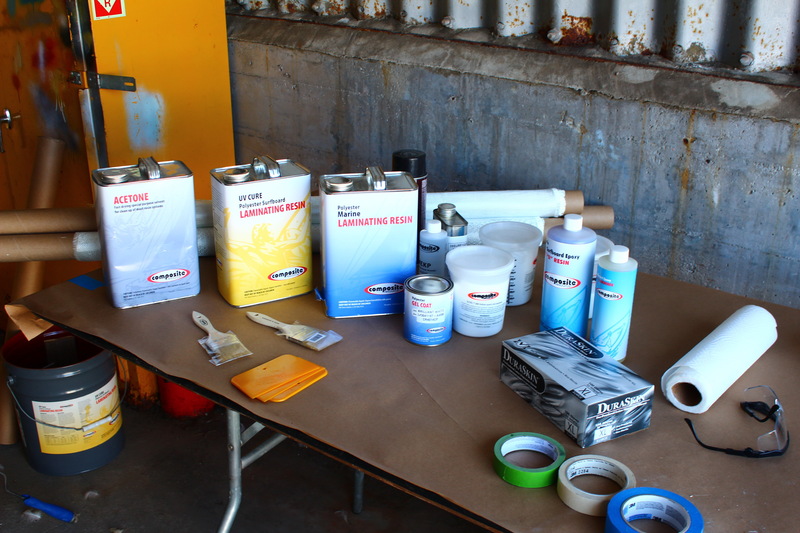 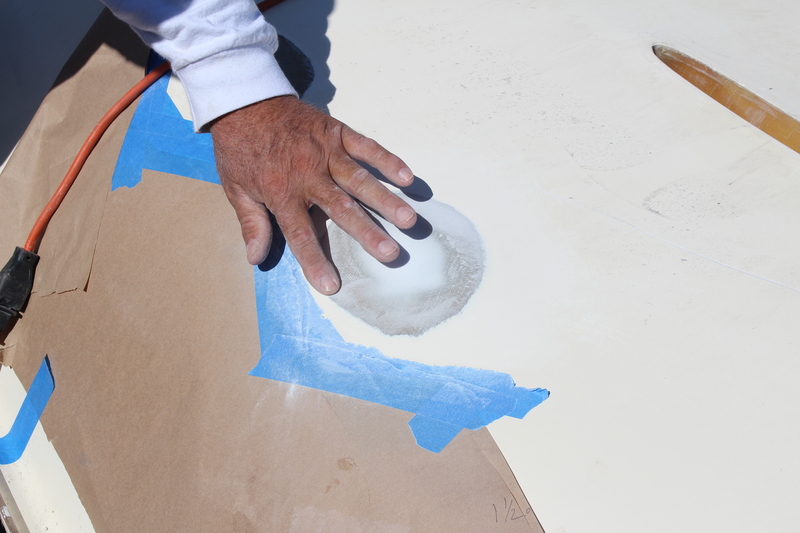 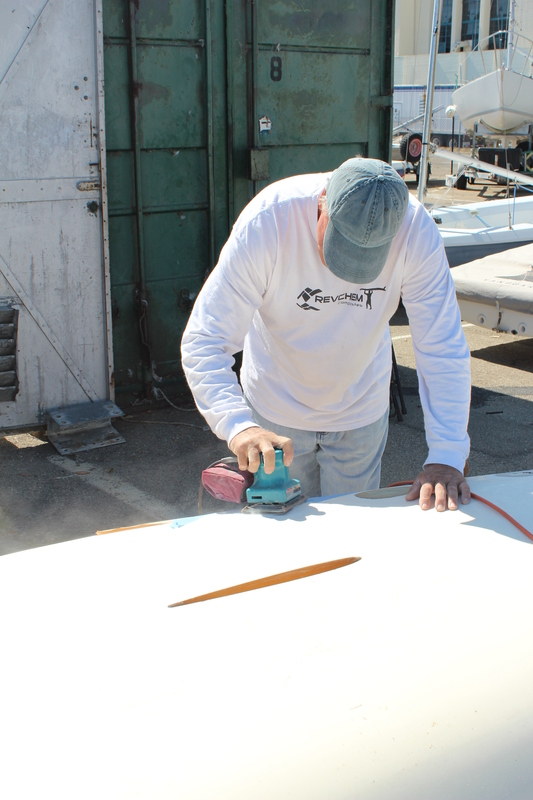 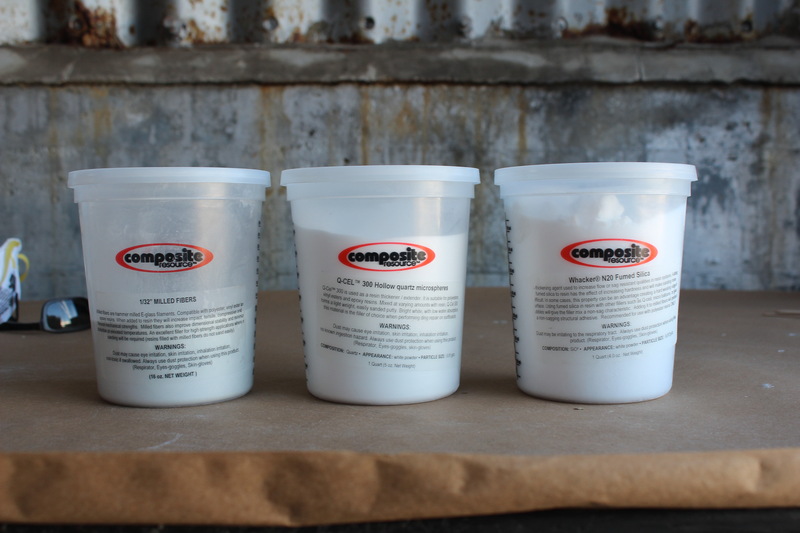 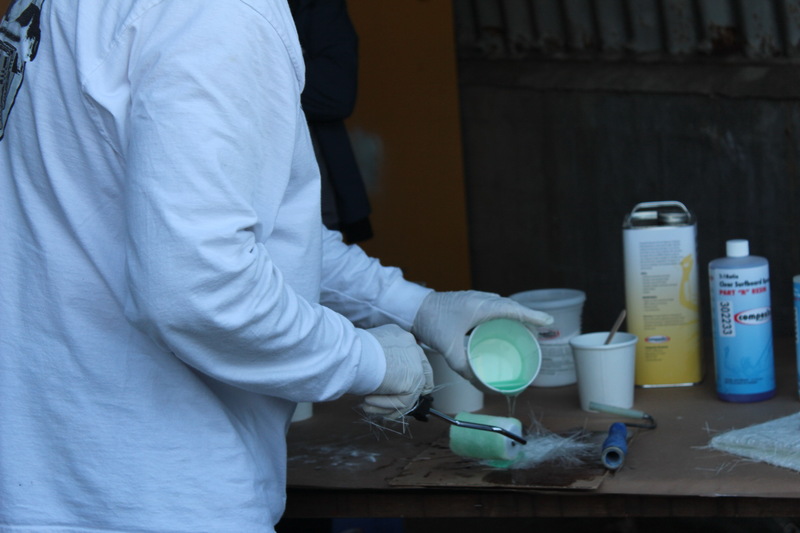 Bay Marine Boatworks will sand and fix the hulls, apply two coats of epoxy, then polish the hulls above the waterline. 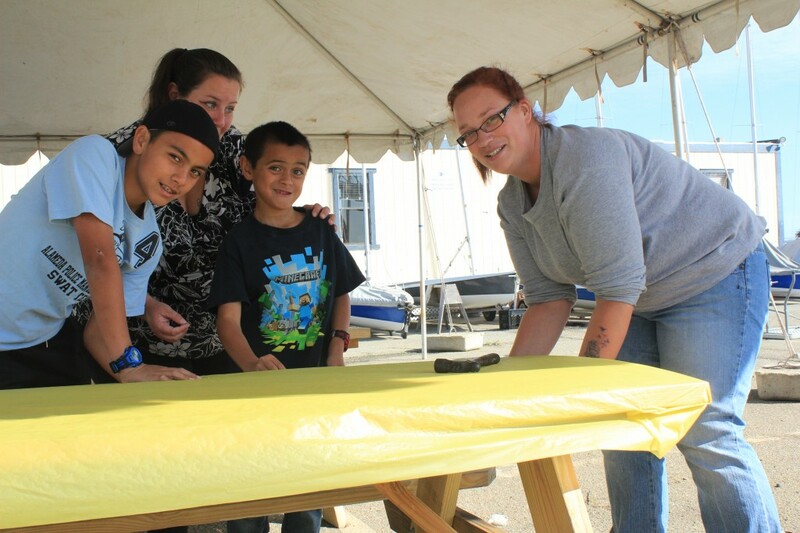 To accomplish this they will use our only road-worthy trailer, retired earlier this year from Moore 24 duty after Karl Robrock’s gracious donation in support of Matt Harper’s gift of Barney. 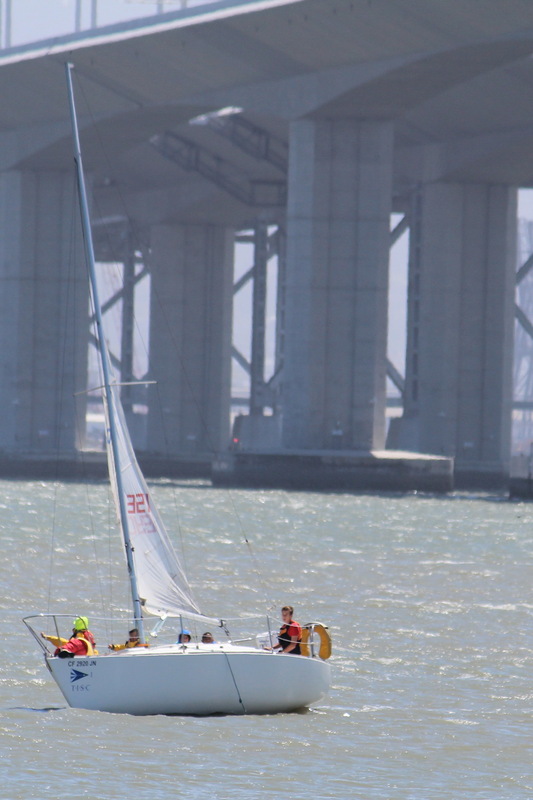 My plan to get a nice picture with the sun out and two J/24’s teaming into Richmond Breakwater was foiled by Michael and Sam’s rapid transit. 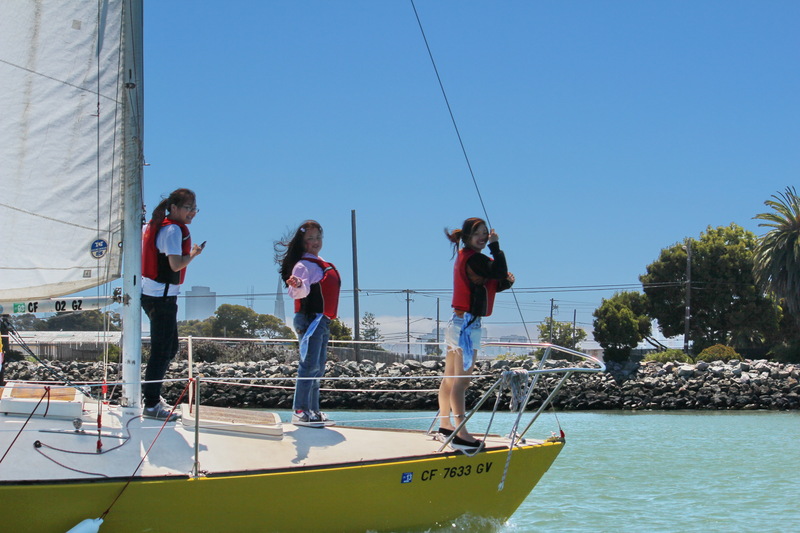 They made it just over 90 minutes ! 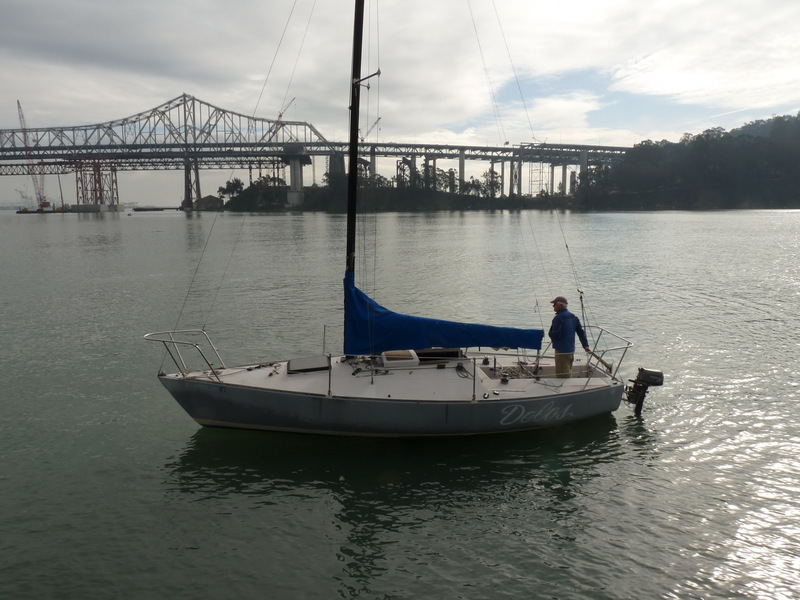 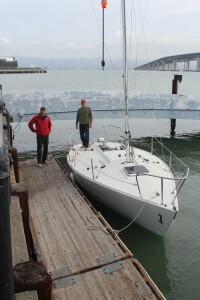 Many connections, donations and volunteer hours lead up to our J/24 Fleet upgrade. 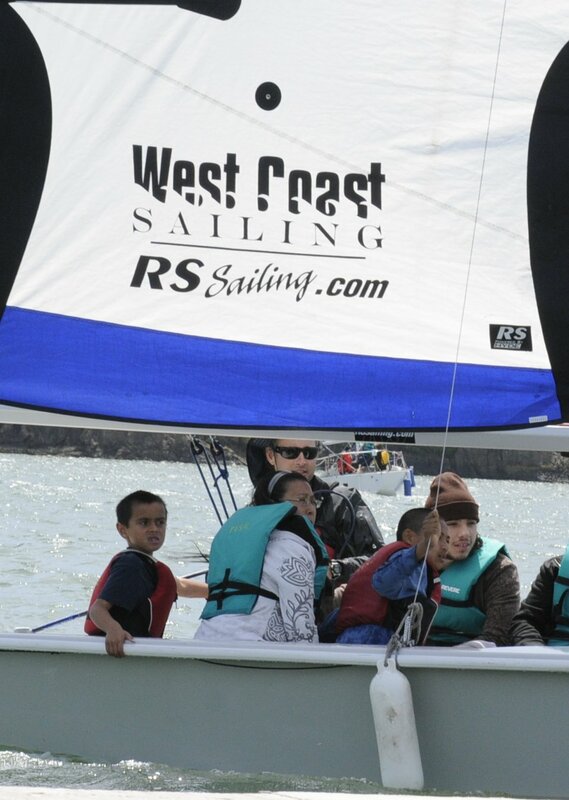 The final and most critical was this summer’s donation from Team Luna Rossa via the Americas Cup Event Authority. 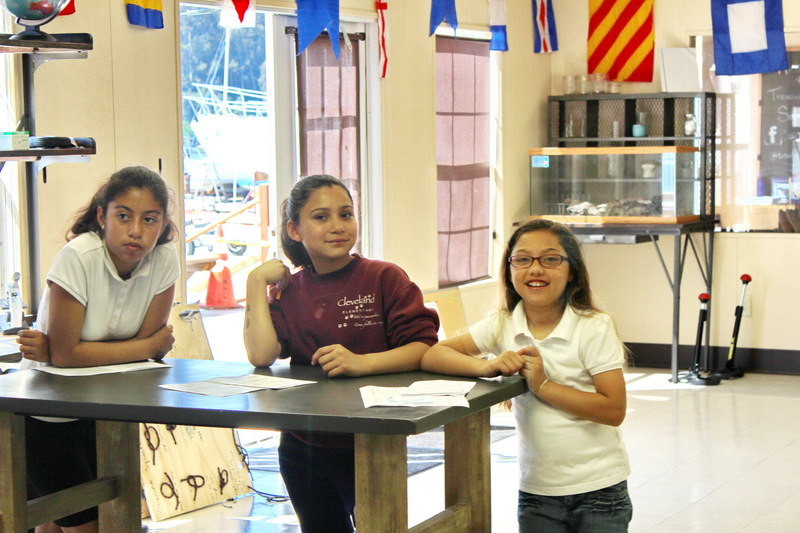 Funds from their donation provided the opportunity for the work now being started at Bay Marine, and for the furniture in the new Activity Center now on line to support SS Learn. 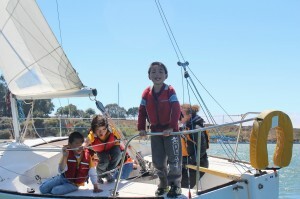 Both support our goal of providing launching points for new horizons for kids of all ages.